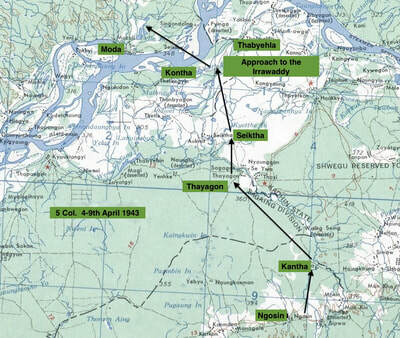 Following 5 Column (their Chindit journey in 1943 through maps). 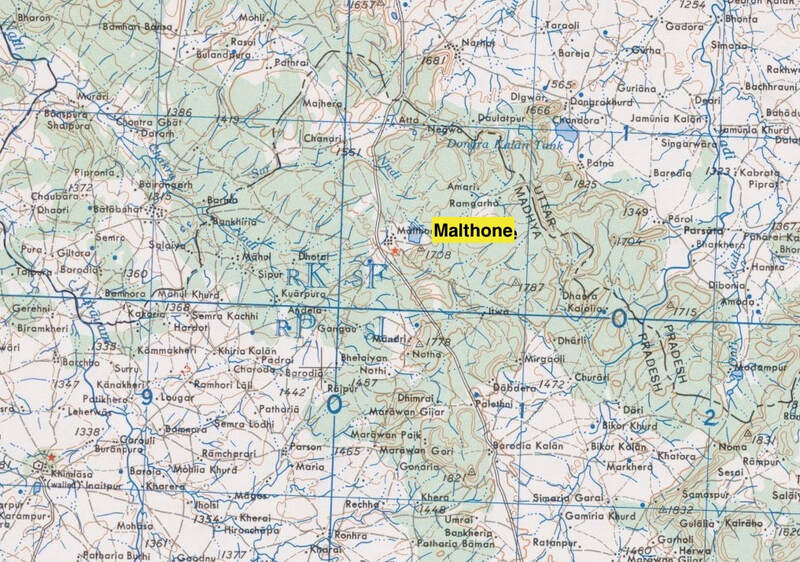 On the 17th October 1943, Major Bernard Fergusson, formerly of the Black Watch Regiment, assumed command of 5 Column at the Chindit camp based at Malthone in the Central Provinces of India. He had replaced Captain Ted Waugh of the King's Regiment who had recently fallen ill and was now deemed unfit to continue with the arduous training regime imposed by Brigadier Wingate. 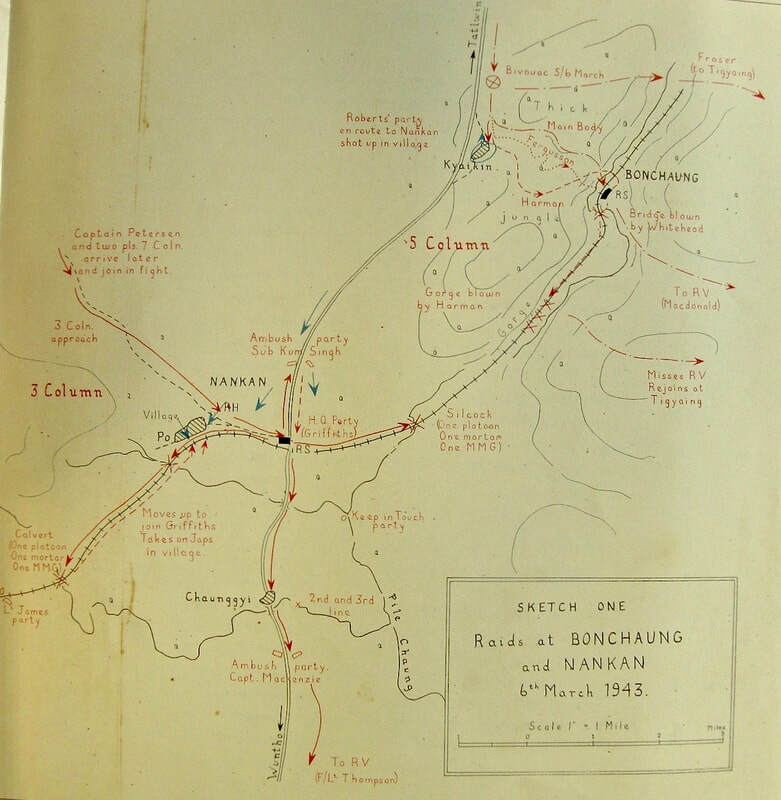 Over the course of my research into the first Chindit expedition, I have often sourced maps on line in order to trace the pathway of various columns during their journeys inside Burma in 1943. Not surprisingly by far the largest collection of these refer to the meanderings of 5 Column. ​In early 2018, to commemorate the 75th Anniversary of Operation Longcloth, the Chindit Society decided to publish a week to week diary of Operation Longcloth, written by Tony Redding and supplemented by maps and images relevant to his text. The vast majority of these illustrations were taken from my own collection. Having gone through the discipline of producing the Longcloth Diary for the Chindit Society's website, I have decided that to reproduce it here, would be the best way of displaying the remainder of the map archive in my possession. Before beginning the diary, shown in the first gallery are the maps for the various Chindit training areas based in the Central Provinces of India from July through December 1942. Also featured in this group is a photograph of the officers from 5 Column, enjoying their Christmas celebrations at the transitory camp located at Jhansi. 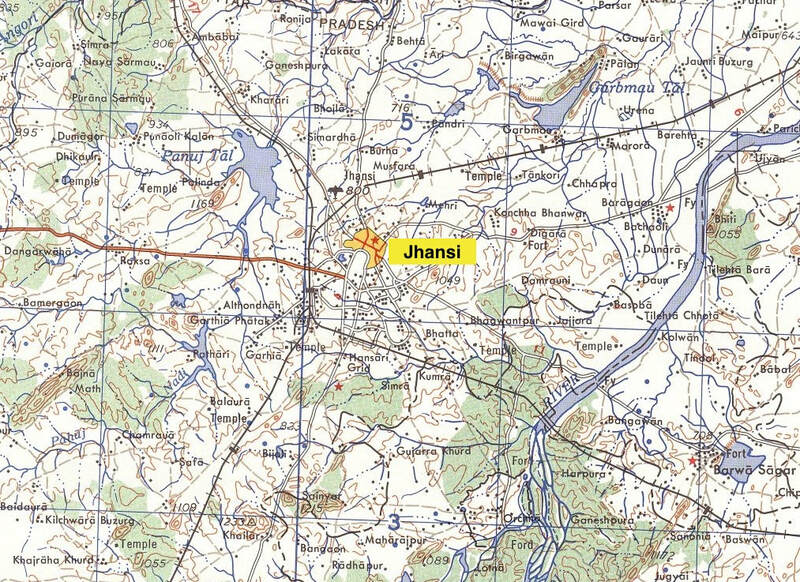 The rail station town of Jhansi was where 77th Brigade congregated for their final training exercise in December 1942 and it was from here that the Brigade set off on their long journey to the Assam/Burmese border. As with all the following galleries and images, please click on any image to bring it forward on the page. Written by Tony Redding, author of War in the Wilderness. 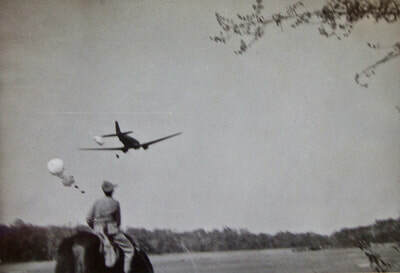 In early 1943 Brigadier (later Major-General) Orde Charles Wingate, DSO, got a chance to prove his Long-Range Penetration (LRP) concept of jungle warfare, based on mobile columns operating behind Japanese lines in North Burma, supplied by air alone and tasked with disrupting the enemy’s supply lines. This was OPERATION LONGCLOTH, a Brigade-strength foray deep into Japanese territory. While achieving little immediate military return, it led to the eventual destruction of Japanese forces in Burma, as it prompted the enemy to the launch the disastrous Imphal/Kohima offensive 12 months later. The 3,000 men of 77 Indian Infantry Brigade underwent some of the toughest training ever endured by British troops. When ready, the seven Columns, each of around 400 men accompanied by mules and ponies, began their epic campaign to penetrate Japanese-held territory and attack roads, railways, bridges and supply dumps. They were to suffer terrible casualties, from sickness, savage battles with the enemy, slow starvation and, for some, the horrors of capture by the Japanese. This year, 2018, is the 75th anniversary of Operation Longcloth. Drawing on War in the Wilderness and, in particular, Bernard Fergusson’s masterly account, Beyond the Chindwin, visitors to this site have an opportunity to follow the 1943 campaign of Wingate’s Chindits as it unfolded. If you read this account, you will be spared none of the terror and suffering. You will also come to appreciate the stoicism, deep courage and extraordinary bonds that developed within the Columns. Major (later Brigadier) Bernard Fergusson commanded No. 5 Column during Operation Longcloth. We follow the 1943 campaign largely through his eyes, as described in Beyond the Chindwin. Major Bernard Fergusson’s No. 5 Column was one of five Columns making up the “main body” of 77 Brigade – No. 2 Group (Northern). They set out for the Chindwin on February 8 1943, with orders to attack the north-south railway and facilities near the town of Nankan, in an area known as “Railway Valley”. There were two additional Columns making up No. 1 Group (Southern). They had orders to cut the railway to the south and divert attention from the main body. This Group set out on the same day. They spent long days marching into position, initially along the Manipur Road. They moved by night, leaving the road free for long motor convoys during the day. They often marched in driving rain, when their heavy packs became even heavier. Wingate’s force was inspected by General Wavell. 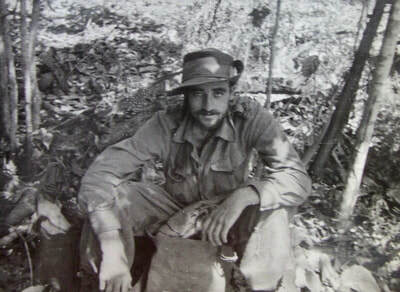 The wider offensive that Operation Longcloth was designed to support had been cancelled, but Wingate succeeded in defending his opportunity to demonstrate the potential of the LRP jungle-fighting concept. In Fergusson’s words: “It was on." The columns left camp after Wavell’s inspection, still marching on the metalled road, but by day on the two-way stretches. 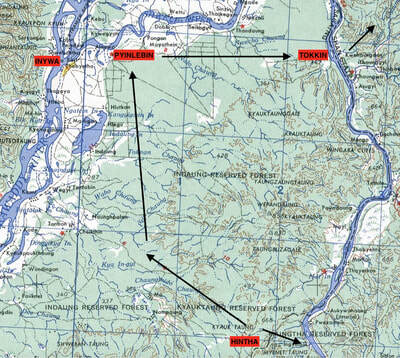 They headed east, Fergusson reaching Lokchau on February 12. Wingate knew he had to conceal the location of the main river crossing. He decided the southern group would cross the Chindwin at Auktaung, acting as a feint, while the main body, the northern group led by Wingate himself, would cross at Tonhe. 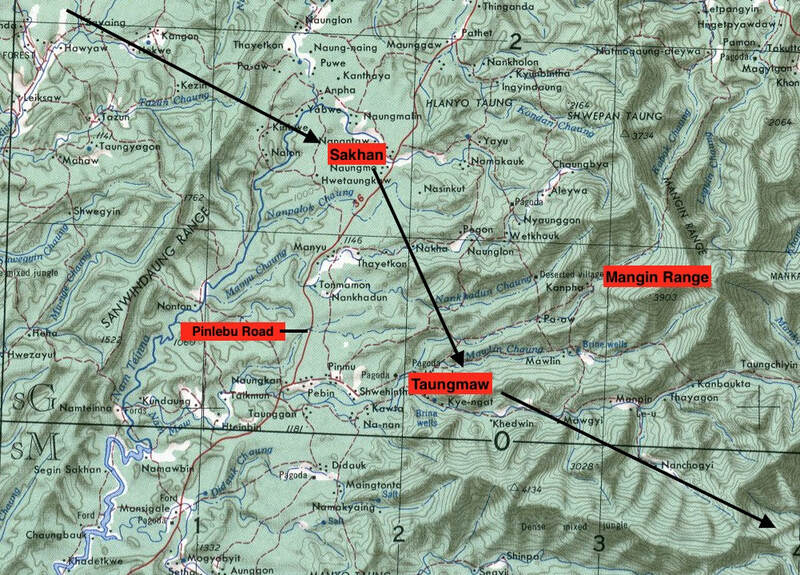 There was even a “second feint”, with a small party ordered to cross south of Auktaung. Fergusson’s No. 5 Column was now the tail of the Brigade – the worst position to be in. 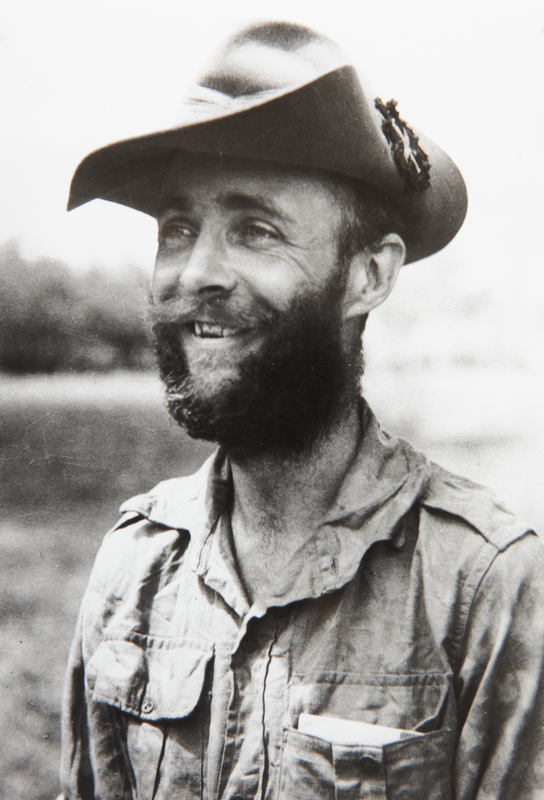 As the first Chindits crossed the Chindwin, Bernard Fergusson assembled his force and read Orde Wingate’s Order of the Day, which concluded with the words: “Finally, knowing the vanity of Man’s effort and the confusion of his purpose, let us pray that God may accept our services and direct our endeavours, so that when we shall have done all, we may see the fruits of our labours and be satisfied.” Then, with five days’ rations in their packs, they set off for the last stage to the Chindwin. They were climbing the last hill before the river and soon “bumped” the tail of the next column ahead. 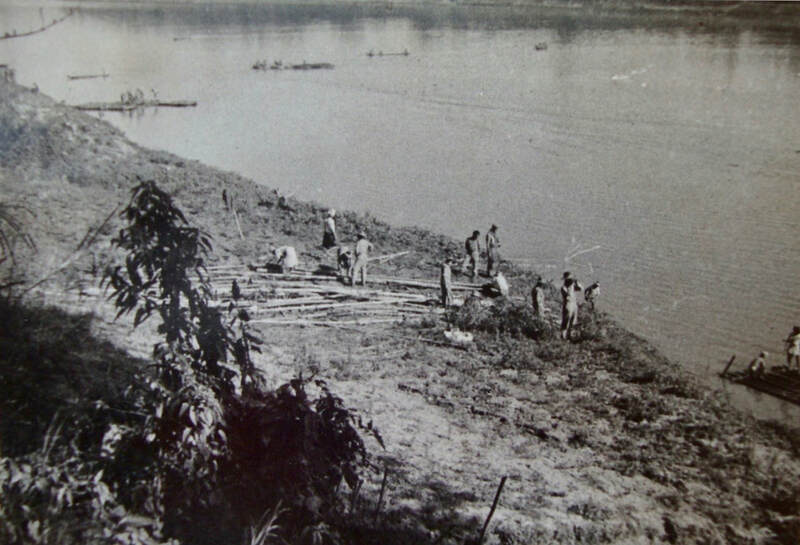 On the morning of February 15, Fergusson and two of his officers went ahead, reached a clearing and saw the river below: “… the Chindwin stretched away north and south, separated from us by about five miles of jungle-covered hill, sloping gently down to the river.” Through glasses, they could see the site for the first supply drop, promised for that night. News came that the Tonhe crossing was going badly. Fergusson, at the end of the queue, decided to cross elsewhere, at a point three miles upstream, then march independently to the drop zone. If things didn’t work out, he would have time to return to Tonhe when, hopefully, the muddle would have been sorted out. The Column Commander crossed in the small native boat. He found the far bank less muddy than feared, but the steep banks would be challenging. The best hope was to focus on where a stream entered the river. The banks here were less steep. They would cross that night, 15/16 February. Animal Transport Officer Bill Smyly stared at the river: “I didn’t really know how to get my mules across. We put canoes out in front, tied some mules together in a line and set out. It is impossible to drive mules across a river. They simply turn around and come back to the near bank. They have to be led across to the other side.” The canoe strategy was Fergusson’s idea. The Chindwin was formidable. Alex Gibson, a Cypher Officer with Major Michael Calvert’s No. 3 Column: “Confusion reigned in the darkness. There was a very strong current and even the best swimmers had so far failed to get a rope across to the opposite bank. This was essential, as none of our Gurkhas could swim.” During the following day, Gibson, an accomplished swimmer, went out and back three times. Fergusson had nothing but praise for the water skills of the Karens of The Burma Rifles: “Their prowess in the water has to be seen to be believed. They would build boats from bamboo and ground sheets in a few minutes.” They crossed the Rubicon. There was tension among the men. The jungle was rich in hazards, from falling trees and rotten branches to an impressive array of stinging and biting creatures, from ants and flies to caterpillars, ticks, scorpions and leeches. They loathed the ferocious red ants populating dry teak jungle. Fergusson said they had “the most vicious sting imaginable. They would stand on their heads and burrow into you as if with a pneumatic drill.” The Chindits learnt to remove leeches with salt or a burning cigarette. One particular worry was the possibility of an intrepid leech finding its way into the most private of private parts. The country up ahead was thought unsuitable for supply drops, so Wingate called for a huge drop at Tonmakeng. Fergusson ran the drop. On February 23 Wingate issued his orders for the next phase. The Columns would enter the Mu Valley and turn south for Pinlebu. An attempt to tackle a Japanese garrison at Sinlamaung village proved abortive, as the enemy left it before it could be reached. The attacking force returned to the main body on February 26. Wingate then gave new orders to the Column Commanders. Fergusson’s No.5 Column left at 03.00 the next morning. Once again, the Columns repeatedly bumped each other, largely because the lead Column – responsible for all the pioneering – made slow progress. On occasion, being lead column was worse than being tail column. Wingate was as impatient as ever. During No.5 Column’s approach to the Pinlebu road, he gave Fergusson a personal demonstration of how to cut through dense jungle more efficiently. Rather than using two or three “slashers” in front, the Brigadier’s method employed an entire platoon. The leaders cut a narrow way, just wide enough for themselves, and the remaining slashers steadily widened it as they progressed, until it reached the 5ft required to allow laden mules to pass. Wingate had ordered Fergusson to leave the Brigade, move independently to his main target, Bonchaung, and bring the gorge down onto the line. Afterwards, he was to cross the Irrawaddy, move down towards Mogok, where the Brigade would concentrate. 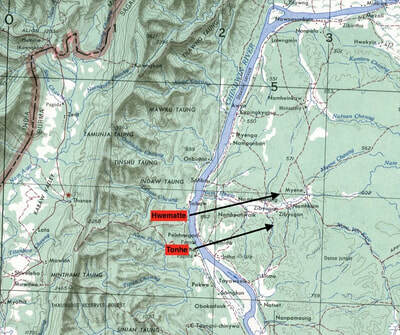 Meanwhile, No.4 Column would attack the Japanese garrison at Pinbon, so allowing Brigade headquarters, 2 Group and Nos. 7 and 8 Columns to move rapidly south down to Pinlebu road. They would soon see action. No. 5 Column moved north during the morning of March 1st, 1943, through impressive country. They were on the edge of an escarpment and a broad valley opened before them, with the high hills of the Mangin Range opposite. Beyond was the Meza Valley and, beyond that, the railway and important communications hub of Indaw. They would then face the formidable Gangaw Hills and, finally, the Irrawaddy. This area, the Mu Valley, was easily defended as it was separated from the railway by hills offering few passes. There was also a good motorable road from Pinlebu in the south to Mansi in the north. Both were believed to hold Japanese forces, as were Pinbon and Thayethon. Once again, the going was bad – not enough jungle cover on the higher ground and, lower down, almost impenetrable country following the Chaunggyi stream. Villagers warned of Japanese troops in the area (although their information lacked precision). When they bivouacked for the night, other columns arrived and settled in nearby. Fergusson, as ever, was anxious to get on. They moved off at first light and soon reached the motorable road running east-west across their line of march. This appeared on maps as a track – the enemy had been busy. There were the unmistakable footprints of Japanese soldiers wearing rubber shoes. Fergusson blocked the road in each direction and began to cross – always an anxious time: “…a column takes 10 minutes to pass a point and is a thousand yards long.” His precautions proved wise. The column rear bumped into coolies carrying kit for a Japanese patrol just 10 minutes ahead of them. The coolies were bribed to say nothing. Fergusson then found himself between a rock and a hard place. The jungle grew even thicker and No. 5 Column’s lead ahead of the Brigade was dwindling. Even worse, Wingate turned up again and laid into the Column Commander, urging faster progress, using his patent method of cutting through dense jungle. At around 4 am on March 3rd, No. 5 Column left the main road and entered the Nam Maw hills, known as “Happy Valley”. They had trouble finding a place to bivouac as the whole area was paddy. Eventually, they found a small wood. It was “thoroughly unsound” but, again, they took a chance: “So ended about the nastiest march of my life”, wrote Fergusson. Fergusson lost a man in Happy Valley – his first casualty. He suspected that he may have fallen asleep during a halt. “We hoped he might catch us up, but he never did, and nothing has been heard of him since.” (The soldier in question was most probably Pte. 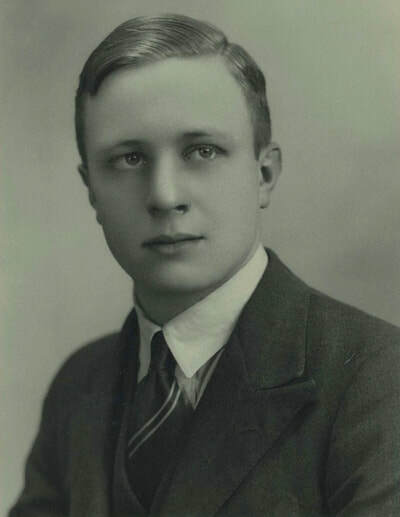 Charles James Fox, who is recorded as having died on the 1st March 1943 and has no known grave in Burma). This shaped Fergusson’s thinking on the greatest challenge, a successful crossing of the immense width of the Irrawaddy. It would take several nights to cross in penny packets in their modest collection of rubber boats. Instead, he would make for the ferry town of Tigyaing, to the south east, “and try to cross in one bold stroke. It was some 20 miles from Katha and still farther from Wuntho, the two garrisons most likely to come out and hunt us.” The aim was to cross at Tigyaing Steamer Station on around March 9. No. 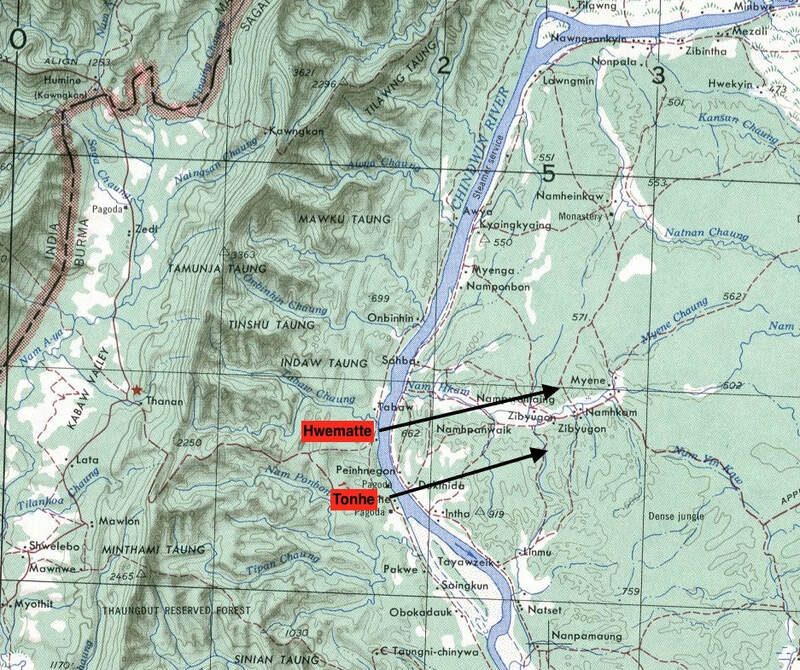 5 Column prepared a force to blow the Gorge, two miles south of Bonchaung Station. 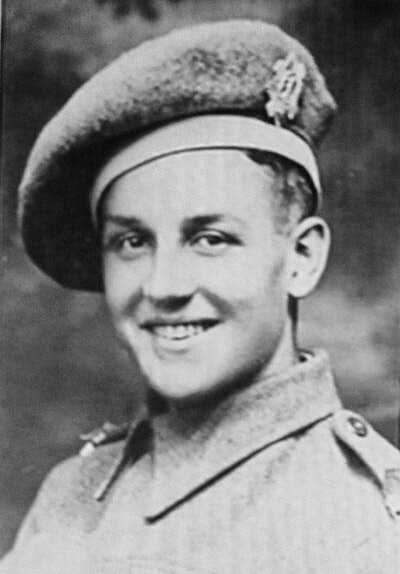 This consisted of half the Commando Platoon, under Lieutenant Jim Harman, escorted by a platoon under Lieutenant Philip Stibbé. Another fighting group was to make for Nankan and keep the small enemy force there fully occupied. 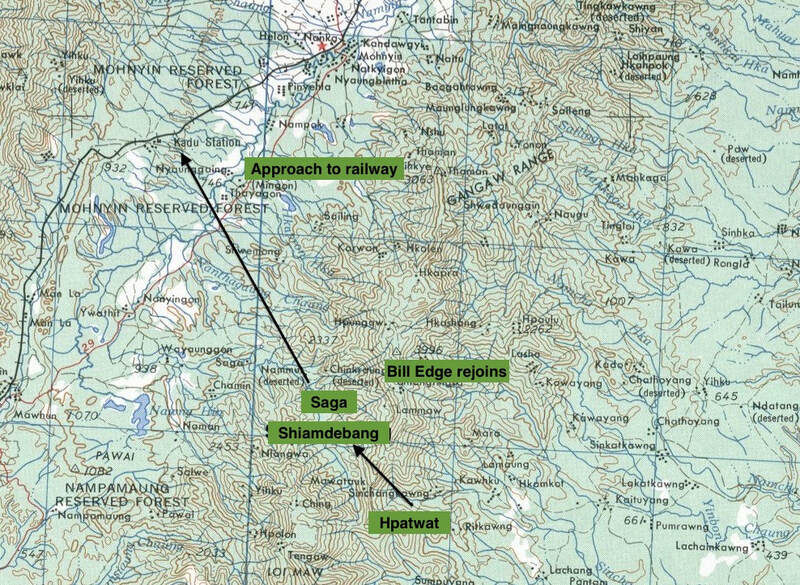 A third party would make for the gorge, while a fourth – the main body – would take the track leading to Bonchaung Station. 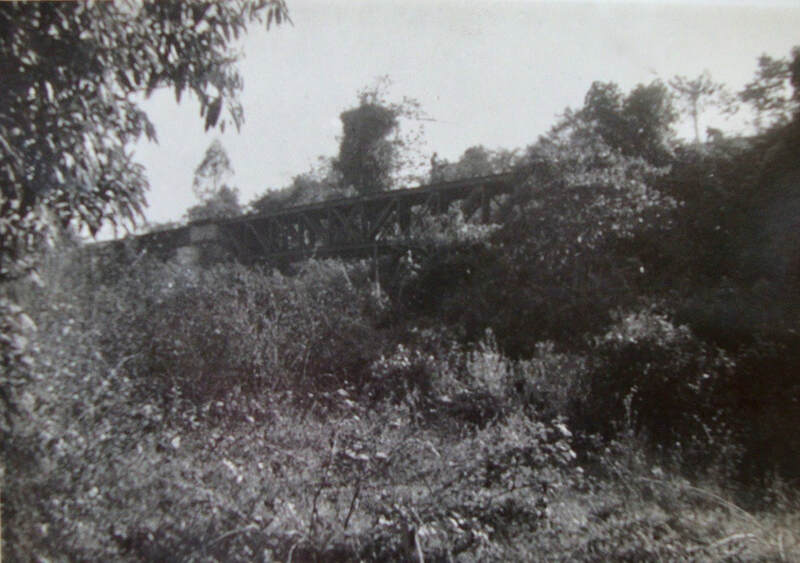 They would destroy the three-span girder bridge at the station’s southern end. 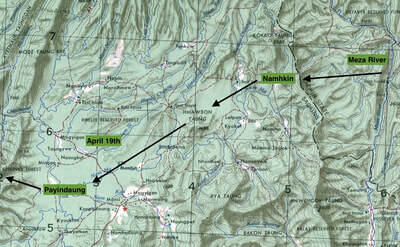 The rendezvous for everyone was a small stream in the Kunbaung Valley, about 25 miles away, up until noon on March 8. Everyone tried to sleep, putting the trials ahead out of their minds. 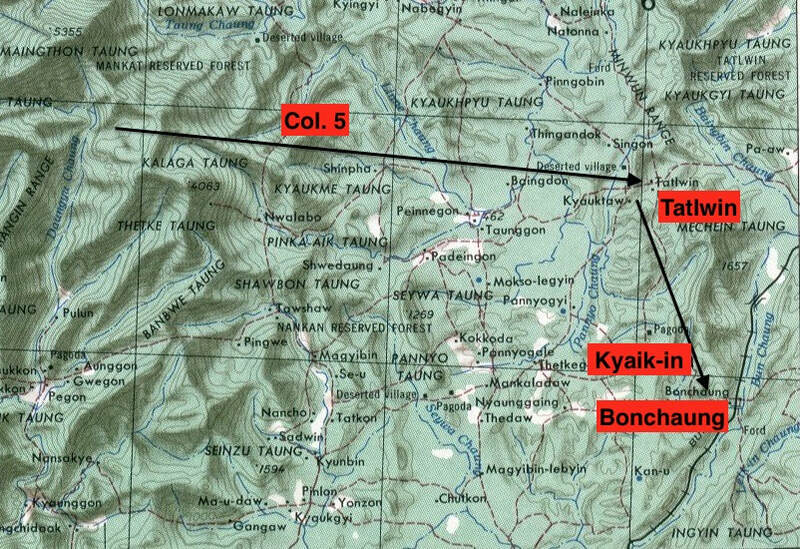 Map of the area around the Pinlebu Road, as 5 Column moved steadily towards their objectives on the Mandalay-Myitkhina railway. On March 6, 1943, No. 5 Column split into its fighting groups and made for the small Japanese garrison at Nankan, the gorge and Bonchaung Station’s bridge. 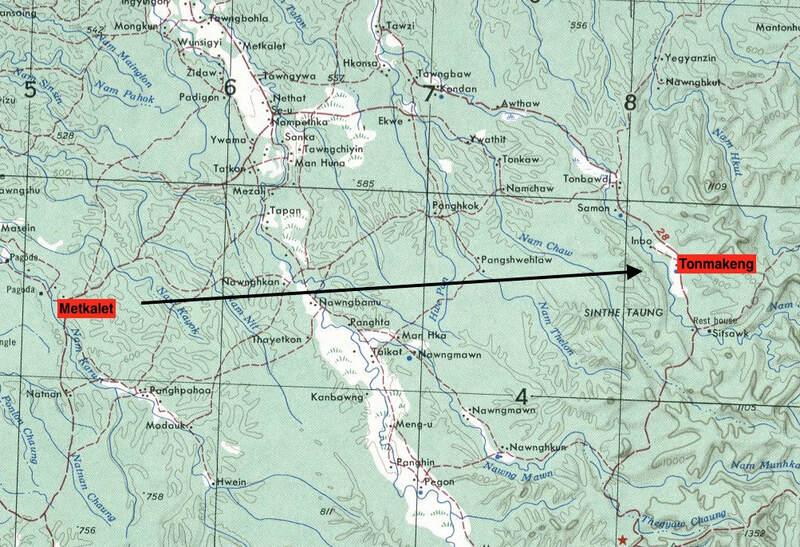 Meanwhile, a Burma Rifles (Burrif) party under Captain John Fraser was briefed to recce the planned Irrawaddy crossing point, the ferry town of Tigyaung, around 35 miles distant. Now Fergusson faced his greatest horror: “What to do with the wounded?” Five men were unable to move, including Kerr. He and two others were carried by mule into the village. The remaining two could not be moved. Fergusson told Kerr where they were. There were 16 dead Japanese around and more enemy troops could be expected when the truck driver raised the alarm. 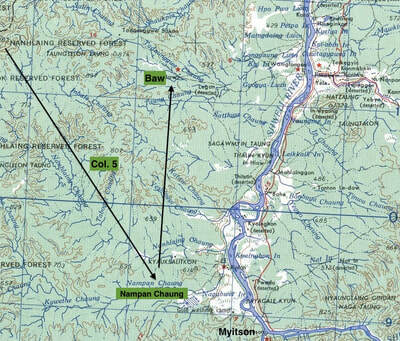 With the Rifle Platoons now back, Fergusson headed off but had trouble finding the Bonchaung track. After a hard struggle they arrived, and found the Commando Platoon busily preparing the bridge for demolition. “Hasty” charges were already in place, so they could be blown if the Chindits were disturbed before the main charges were ready. When the bridge was blown the results were impressive: “The flash illuminated the whole hillside. It showed the men standing tense and waiting, the muleteers with a good grip of their mules; and the brown of the path and the green of the trees preternaturally vivid. Then came the bang. The mules plunged and kicked, the hills for miles around rolled the noise of it about their hollows and flung it to their neighbours … all of us hoped that John Kerr and his little group of abandoned men, whose sacrifice had helped to make it possible, heard it also, and knew that we had accomplished that which we had come so far to do.” Then they heard a second great explosion – the gorge was blown. On that same day, Major Michael Calvert’s No. 3 Column blew up two large railway bridges (one with a 300 ft span). 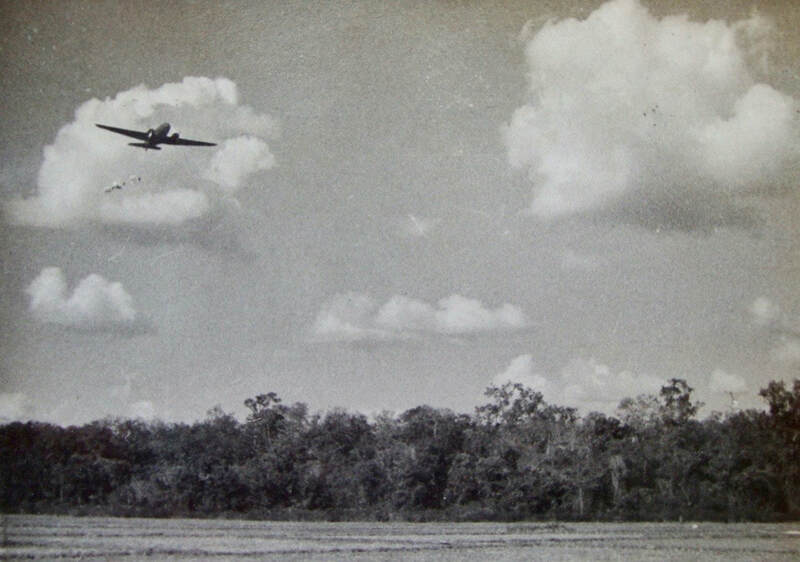 Calvert called in an air strike against Japanese positions at Wuntho, 10 miles to the south. They then set ambushes and killed many Japanese without loss to themselves. Both No. 3 and No. 5 Columns had mauled the railway. 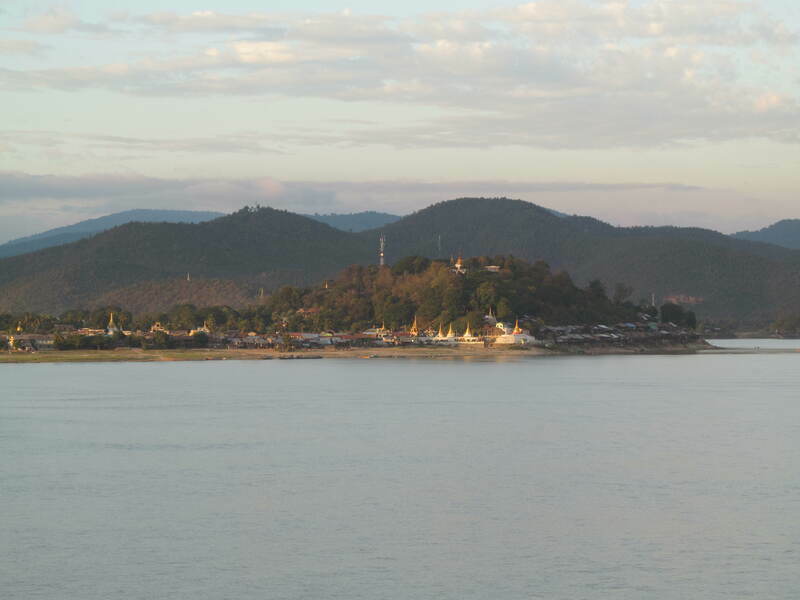 It was now a question of avoiding trouble and getting to the Irrawaddy as quickly as possible. As they marched, No. 5 Column’s Commander worried about the party that had been dispatched to Nankan. He had expected them back by now. He could only hope this group of around 30 would turn up at the rendezvous. They halted at noon on March 7 – Fergusson wanted the wireless. He reported the destruction of the bridge and the blown gorge. 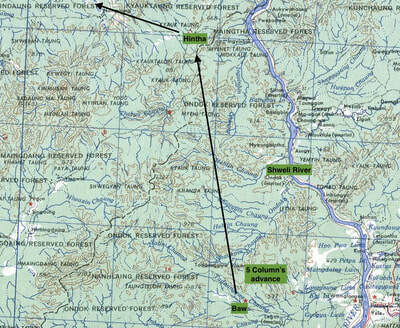 He also learnt that Captain John Fraser was making good progress towards Tigyaing, the river crossing. The Column then reached a fordable point on the Meza River, at Peinnegon village. There was smallpox in this village, so the men didn’t linger. They turned south, moving along the east bank of the river. They halted in less than a mile. 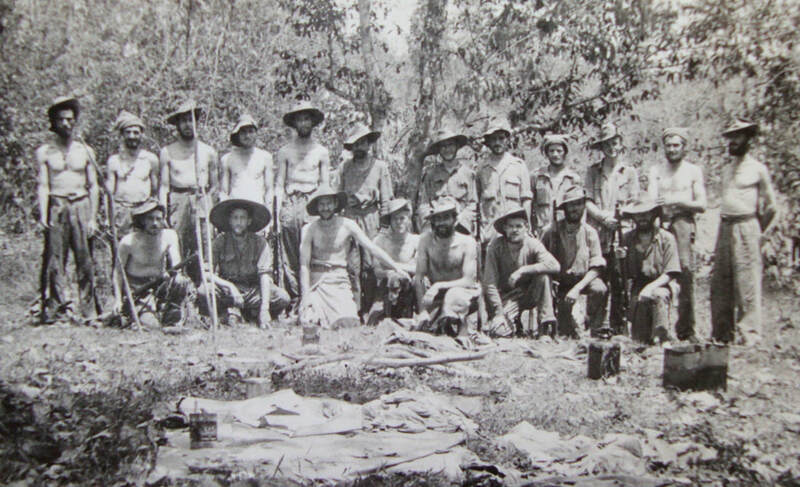 Fergusson wrote: “… the jungle was exceedingly thick and all of us tired: we had marched 113 miles in seven days and had a considerable emotional strain as well, while our loads weighed an average of 60 lbs.” They stopped for the night at 16.00 and were asleep before dark. On March 8 a small group was sent on ahead to reach the RV, as it closed at noon and it was possible that the main body wouldn’t get there in time. In fact, the main body stopped before the RV for a meal and, most importantly, a scheduled communication with Brigade. Fergusson received the message that No. 1 (Southern) Group had not been heard from for 10 days, suggesting that crossing the Irrawaddy was hazardous. No. 5 Column was given discretion to cross the Irrawaddy or, instead, base itself in the Gangaw Hills and harass railway repair gangs. The Southern Group had enjoyed mixed fortunes. No. 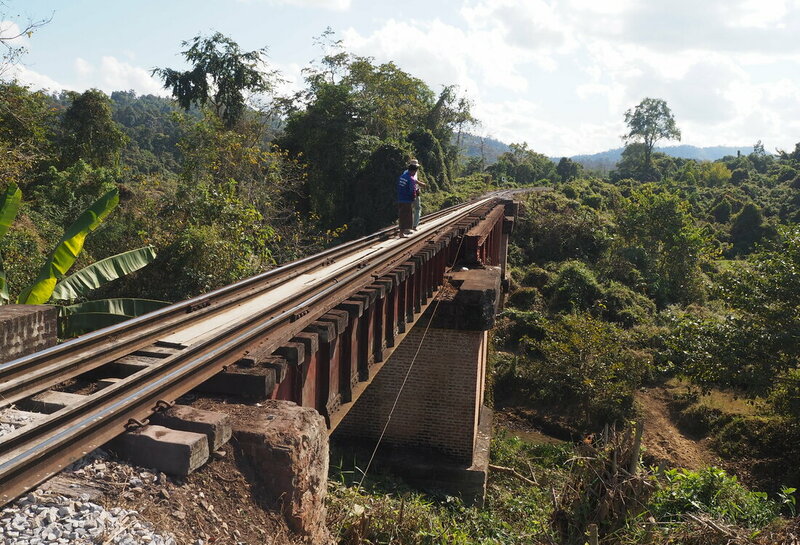 1 Column was the first to cut the railway, on March 3 just north of Kyaikthin. However, on the preceding night No. 2 Column fought an action near that village and was dispersed. Fergusson, meanwhile, found the warning message “distinctly unsettling”. He told Brigade he would think on it and respond with a decision in a few hours. As they moved on the Column Commander wrestled with the issues. He had received a favourable report on the prospects for crossing at Tigyaing and the Japanese would be expecting them to start their return to India rather than go further east. On the other hand, crossing the huge river would be tricky and No. 5 Column was still incomplete. There was also the thorny question of how to get back. He did not know that the Northern Group’s No. 4 Column had been ambushed and broken up. This meant that Wingate was left with just four columns under direction, to continue Longcloth. There was no sign of the missing groups – the Nankan and gorge parties. Bernard Fergusson told John Fraser that he’d wait at the RV for another 24 hours. Fraser said there were no Japanese at Tigyaing. Then the Nankan party reached the RV. They had been short-handed following the action involving Kerr and decided not to go on to Nankan. The No. 5 Column Commander signalled that he would attempt the Irrawaddy crossing: “… I proposed to try it and then to march for the Shweli bridge on the road running from the main Burma Road up to Bhamo. If this could be destroyed … the isolation of Myitkyina would be complete …” He hoped to reach this suspension bridge by around March 20. Hungry and exhausted, they were still prepared to cross the gigantic Irrawaddy and march on east to destroy another target. Calvert’s No. 3 Column was also making for the Irrawaddy, but the Japanese were hot on their heels. On March 8 Fergusson and Calvert had been given discretion on the issue of whether to cross the Irrawaddy, but then Southern Group’s No. 1 Column got back in touch - after a long radio silence - and announced their crossing of the Irrawaddy during the night of March 9/10. This made up Wingate’s mind. 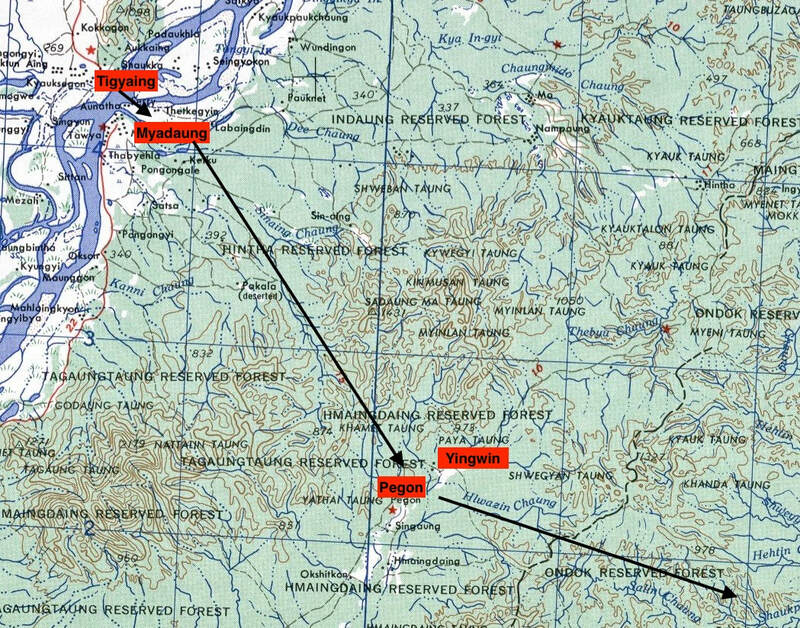 Northern Group columns would also cross, on 10-13 March, south of Tigyaing. 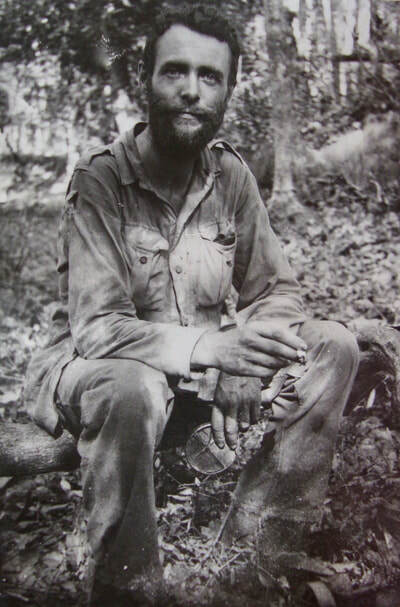 On the morning of March 9 Fergusson heard, with a mixture of relief and annoyance, that Jim Harman’s missing gorge group had already joined John Fraser at Tigyaing. This group had reached the RV two hours early, found no-one there and decided to press on to the river. Fergusson’s main body set off for the ferry town - a nervous march across open paddy. They could be seen for three miles in any direction. The main body arrived safely and met up with Fraser. Fergusson then set the wheels in motion. 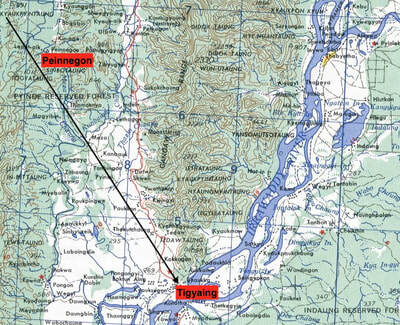 Three platoons were told to enter the town, take control of the boats and form a perimeter around Tigyaing. The main body would then enter. Within minutes of their arrival, a Japanese aircraft flew over the town and dropped leaflets, urging the Chindits to surrender. No. 5 Column’s Commander felt that the Japanese wouldn’t have bothered with leaflets if they were positioned to intercept them before a crossing. Nevertheless, there was a Japanese garrison at Tawma, just eight miles south west, across the marshes. They had to crack on as quickly as possible. Around 20 boats were soon busy. The men had to splash across the shallows from the waterfront to the main sandbank, where they embarked. Two platoons were told they were next. 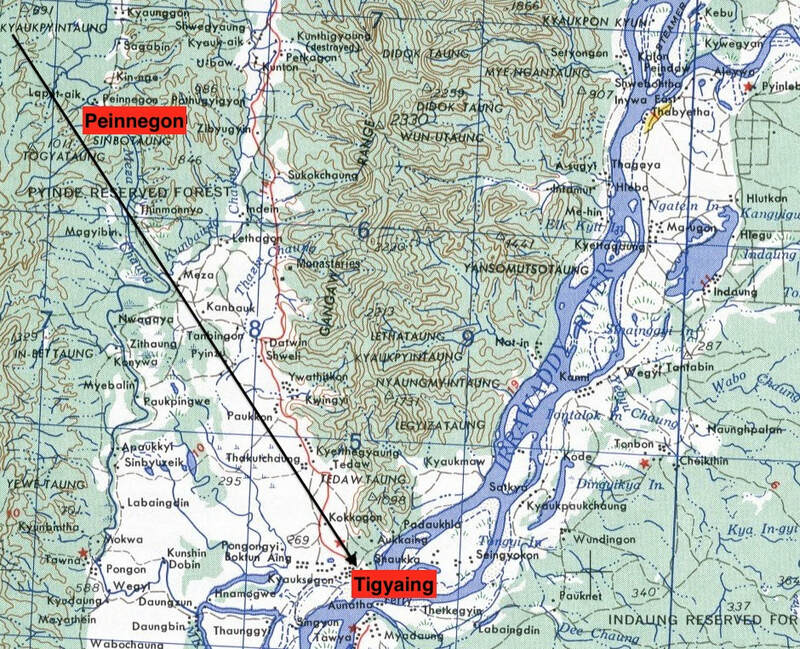 Immediately opposite the crossing point was Myadaung village and beyond were the hills around Pegon, the location of their much-needed supply drop. They bought up supplies in Tigyaing – eggs, potatoes, rice, vegetables and fruit. Men and animals continued to cross over to the big sandbank, with others coming forward as boats became available. The afternoon was running thin but it looked as though they could be over before dark. About 45 minutes before dark, only one platoon remained to cross. It was brought in to hold a smaller perimeter around the waterfront. Suddenly, the atmosphere cooled, the waterfront crowd melted away and the boatmen – instead of bringing their boats back – disappeared downriver. They had just one boat still under command when this happened. Fortunately, another boat, on the other side of the river, was commandeered before it could shove off and retreat. The heavily-laden Column Commander struggled to enter the boat. He was hauled in by the seat of his trousers. Fergusson crossed the river, under fire, in unflattering fashion: on his knees, with his behind in the air. He couldn’t move for fear of capsizing the small boat, which rolled at any excuse. Michael Calvert’s No. 3 Column had a similar experience, with the rear guard coming under fire. They crossed successfully but at the cost of seven dead and six wounded. Now on the other side, Calvert had to leave his wounded with the villagers. One was given a lethal dose of morphine, as an act of mercy. Calvert decided to reach out to the Japanese Commander who would eventually find the remaining five. He left a note which included the sentence: “I leave them confidently in your charge, knowing that with your well-known traditions of Bushido, you will look after them as well as if they were your own.” Much later, Calvert learned that his note had worked - the wounded were treated reasonably. Fergusson’s No. 5 Column rested up after the crossing. They marched on for a few miles then called a halt in dense jungle. The Column Commander realised that to push on hard would endanger them, as the enemy would calculate their likely progress and would soon be on their heels. 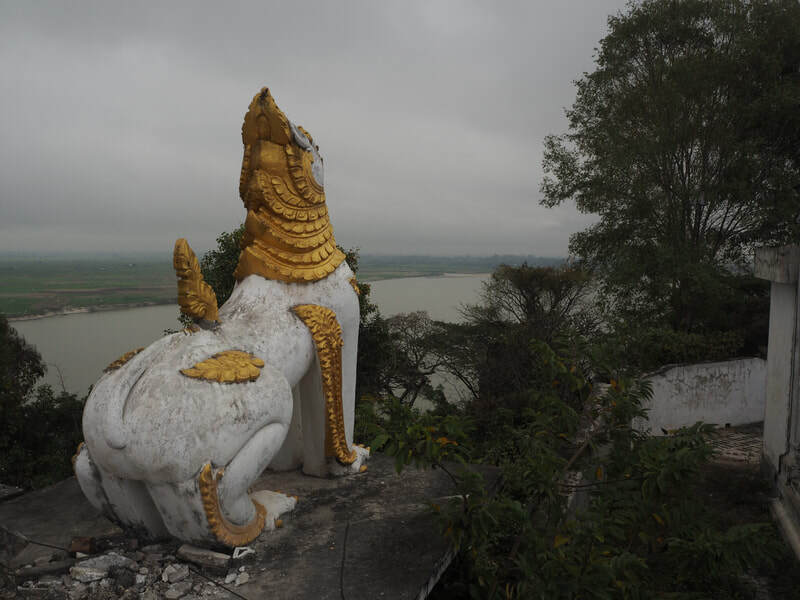 The other side of the Irrawaddy felt safe but, within a short period, the country between the Irrawaddy and the Shweli would begin to feel like a prison. Fergusson struck out for Pegon on the 11th, hoping to reach it the following day. He would then call for a supply drop on the 13th. The jungle was the thickest they had encountered so far. On the 12th they marched along a virtually dry chaung. They avoided the road to Pegon and planned to descend on the village through the mountains that hedged it. 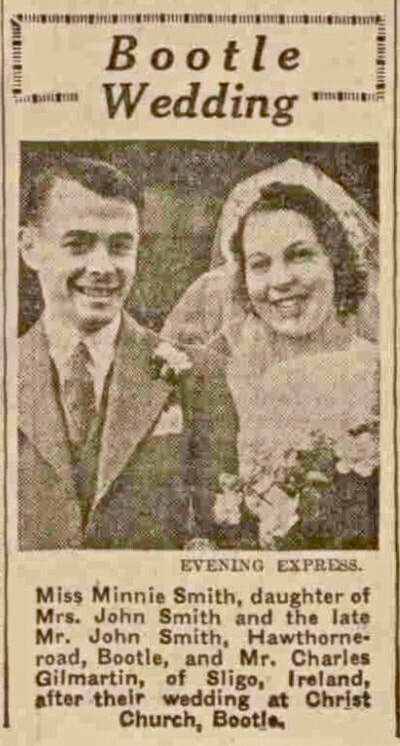 At midday on March 12 the Column heard aircraft and were shocked by a wireless message revealing that the Pegon drop provisionally arranged for that day had just been delivered. Fergusson couldn’t believe that his request was honoured without the usual confirmation. ​They spent the night at the head of the Myauk Chaung. On the morning of the 13th they moved off, climbing heavily then stopping at noon for three hours. There was a Sick Parade and Platoon Commanders inspected their men’s feet and rifles. The wireless was in operation. The men ate whatever was available to them. It was less than four miles to Pegon and Fergusson planned to give his men a rest that afternoon. The problem was that the route down from the mountains was so steep that it was impossible to get the mules down. By 16.00 they were no nearer the village than in the morning. A drop had been confirmed for the following day, the 14th. Eventually, a track was discovered and an advance party managed to reach the drop site before the aircraft arrived at 10.00. The signal fires were ready for them. Fergusson wrote: “Out of that drop we got five days’ rations and the petrol, as well as much mail, newspapers and Penguin books. The only things missing were the boots and clothing for which we had indented and of which we were in dire need.” They were now well ahead of the Brigade and making for Inywa, where the Shweli and Irrawaddy come together. With time to spare, No. 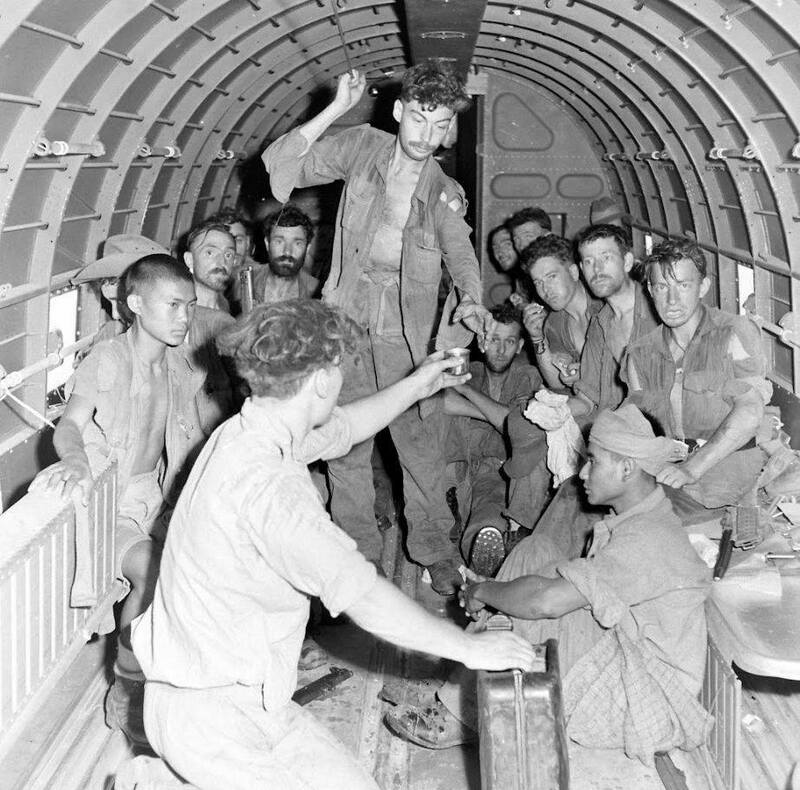 5 Column waited for the aircraft to arrive with the all-important boots and clothes – anxiously awaited as the men were now infested with lice. Then came the news that aircraft couldn’t be spared for another drop. The next day, March 16, they found a few stinking waterholes at noon. They found two more that night and drank them dry. By morning, enough water had oozed into them to fill their water bottles for the trials ahead. 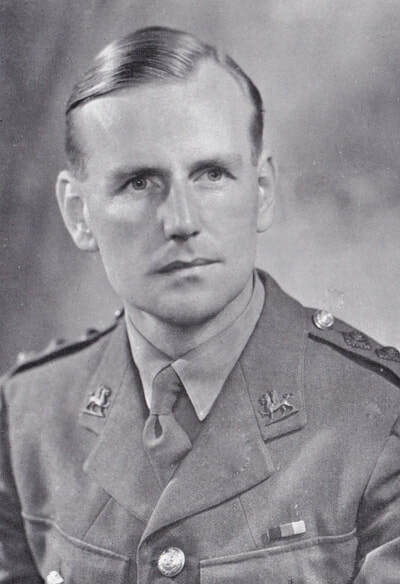 Wingate’s Columns were now being hunted in a waterless plain heavily patrolled by Japanese forces. They were near the limit of the range of supply-dropping aircraft. The four columns would have to go hungry for extended periods. There were only five aircraft earmarked for supply drops and two were Hudsons, unsuited to this role. Their only comfort was the presence of meat on the hoof. On March 18 Wingate and 1,200 men reached Inywa village and crossed the river, as No. 3 and No. 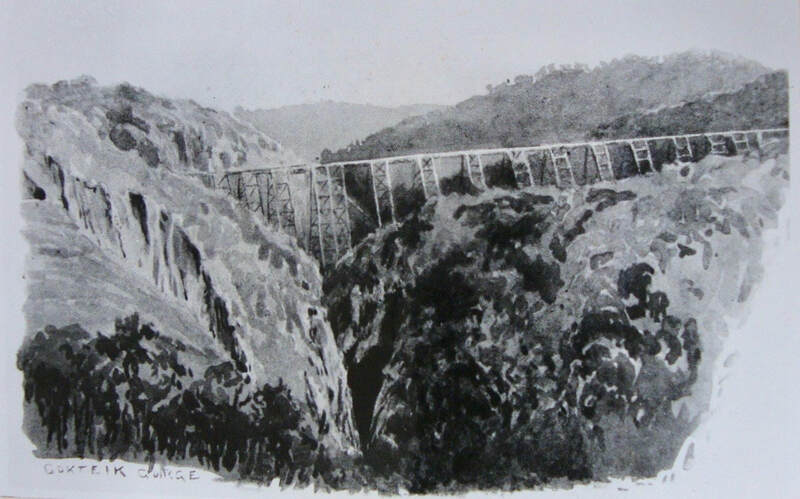 5 Columns made for their new target, the Gokteik Gorge viaduct carrying the Mandalay/Lashio road and railway. 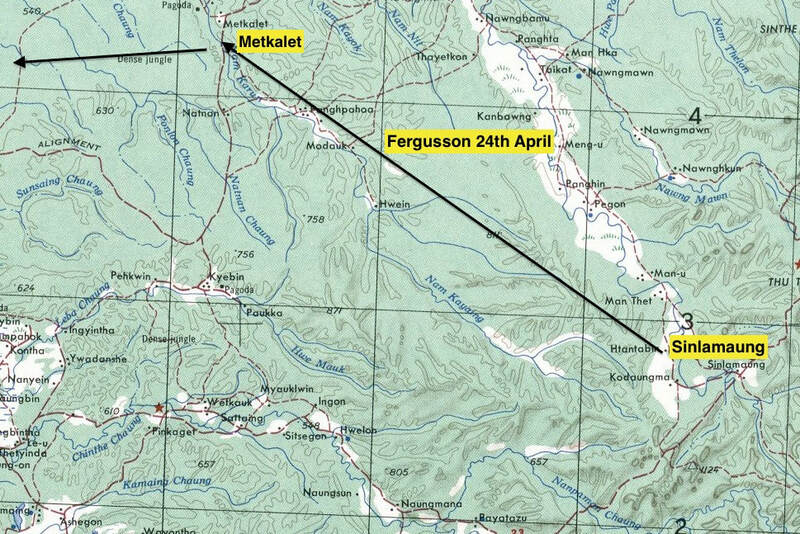 This mission was ambitious, to say the least, as the Gokteik Gorge was around 150 miles away. Calvert’s No. 3 Column would blow the viaduct and Fergusson’s No. 5 Column would shield them, protecting the approaches. On the way, Calvert was as aggressive as ever. He set an ambush for a Japanese Company and No. 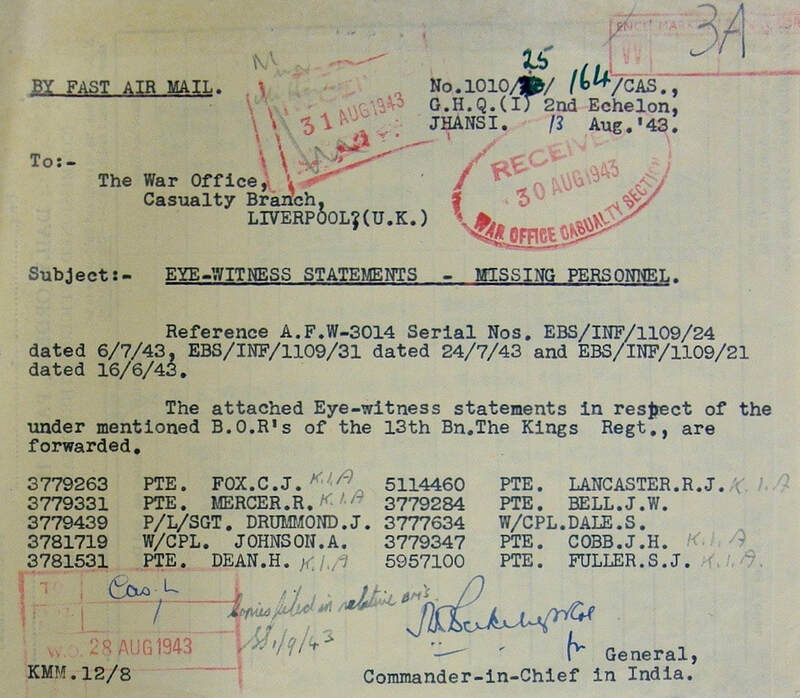 3 Column shot them to pieces – killing around 100 for the loss of one Gurkha NCO. In addition, 7 Column and 8 Column were to fight a highly successful action later (March 23), killing 219 Japanese for the loss of two dead and 17 wounded. The Chindits repeatedly demonstrated their ability to punish the Japanese. Some Columns were luckier than others regarding supply drops. On March 18 Calvert’s No. 3 Column received 10 tons – Longcloth’s biggest supply drop. Fergusson’s No. 5 Column was in for 93 days and received just 20 days’ rations. No. 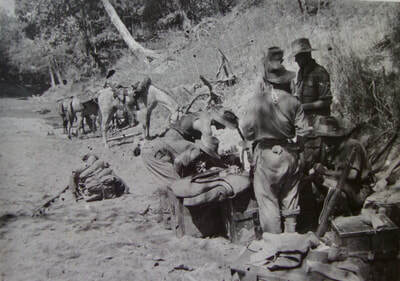 5 Column had received a two-day ration bonus for receiving the Brigade drop at Tonmakeng, but had to stretch seven days’ rations for 16 days before their next drop at Pegon. On the 17th, Bernard Fergusson briefed his Column, with the men trying to ignore their commander’s rather tactless announcement that they were now further east than any other British troops. They reached the dry Nam Pan and then the flowing Nam Mit Chaung the following day. They took their first wash since crossing the Irrawaddy a week earlier. After a few days an outbreak of what was believed to be anthrax killed off a number of Smyly’s mules, before finally petering out. Fergusson’s instinct for danger was still finely honed. While waiting for Wingate to come up, having received fresh orders, he moved his bivouac for security reasons. The way down to the river had taken on the appearance of a track. A Japanese patrol soon attacked the now empty camp. 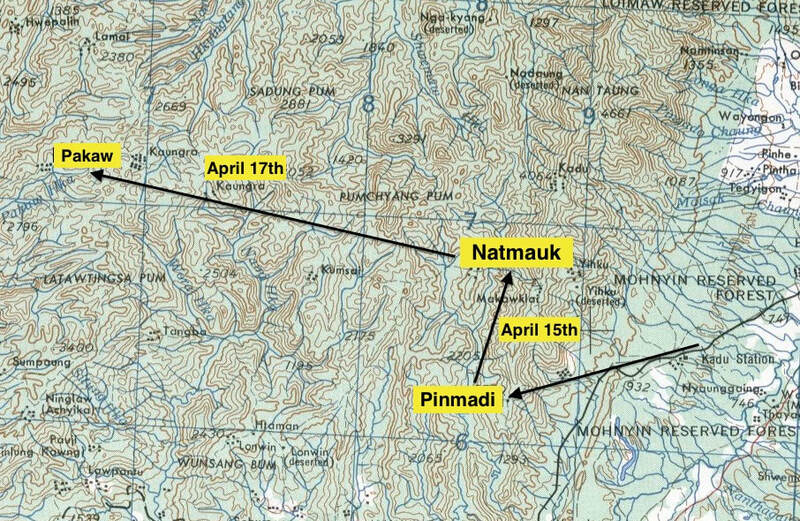 Another drop was planned for March 23, but that meant going back to the dry bed of the Nam Pan, now 12 miles to the north; No.5 Column set out slowly for the drop site. The men were encouraged to take extra rest whenever possible. They noticed that more animals were beginning to drop out and die. They met up with No. 1 Column at Nam Pan. They had taken a drop but they warned that a Japanese unit had been tracking them. On March 23, No. 5 Column received a disappointing three days’ rations, then set out, as per fresh instructions, for Brigade HQ at Baw village. The next drop produced just one day’s rations. Then came the order to return to India. Wingate had been instructed to bring his Columns back. They would receive no more supplies when so far east. Calvert took the news badly - now he would never blow the Gokteik Viaduct. Commenting on the order to return, Fergusson wrote: “This was wholly and absolutely unexpected.” He worried that the news would trigger “a disastrous frame of mind for soldiers whose whole safety depends on prompt, resolute and unhesitating action.” They were now ordered to break up into small dispersal groups, to increase the chance of reaching safety. Calvert’s Column was ordered to make its way independently back to India. 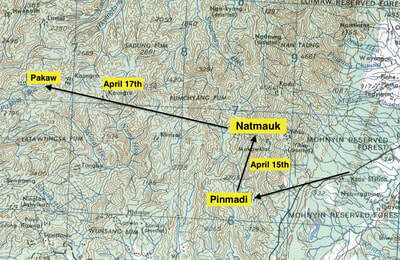 The dispersal conference was called on March 30; they were to split into nine groups, each taking a different route west. In a straight line, it was around 120 miles to the east bank to the Chindwin, but the true distance in such heavily convoluted country was closer to 180 miles. Calvert’s men ditched all heavy equipment, including the wireless. They ate the remaining food. They would be living off the land, in an all-or-nothing fight to survive. Meanwhile the Japanese were bringing up more troops and turning the area between the Irrawaddy and Shweli into a gigantic mousetrap. Leaving the Hehtu Chaung at 0100 on March 27, Fergusson’s No. 5 Column made for Inywa, where the Shweli enters the Irrawaddy. The plan was to reach the ferry town by 6 pm the following day and begin crossing that night. There would be tasks for each Column. Burrif HQ would help No. 8 Column collect boats from the lower reaches of the Shweli. No. 7 Column would cross first and form a bridge on the west bank. Brigade HQ would then cross, followed by Fergusson’s men – who would have the honour of forming the rearguard. Major Fergusson described the approach march as “horrid”; there was some light skirmishing with an enemy patrol as they neared the river. No. 5 Column was ordered to lay an ambush. Fergusson organised a sloppy, noisy march along a Chaung, to distract attention from the rest of the force. They then made a false bivouac and lit enormous fires, set booby traps and quietly moved away to sleep for a few hours. They were one mile from Hintha village and they knew that there was every likelihood that it was occupied. 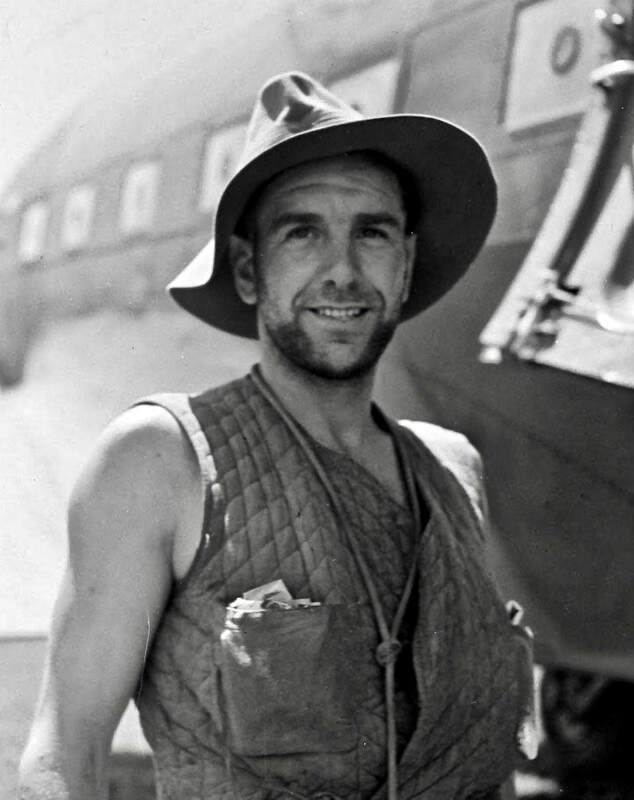 Orde Wingate led the way out on March 27, 1943, planning to cross the Irrawaddy at Inywa on the night of the following day. In Major Fergusson’s No. 5 Column, Animal Transport Officer Bill Smyly was ordered to kill the mules. Some were shot but, with worries about the noise, the order came through to kill them silently. This resulted in a ghastly experiment. Smyly had had enough; he turned the animals loose in the jungle. Fergusson’s men joined Brigade HQ and 7 and 8 Columns on the Hehtin Chaung. There would be no supply drops until the Irrawaddy was crossed and there would be no foraging in the villages, for security reasons. 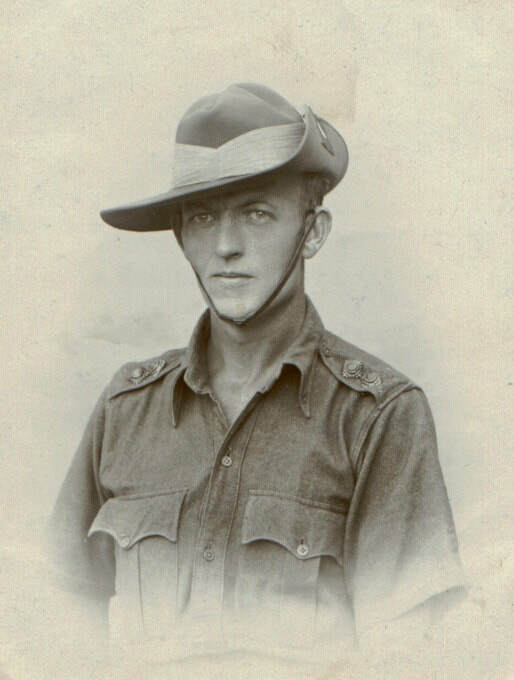 Some Chindits – including sections of Major Gilkes’ 7 Column – took the longer but safer route to China. This Column split into three dispersal groups. One headed for India, the other two later decided to make for China. Michael Calvert’s No. 3 Column was moving independently, about 20 miles from the main body. 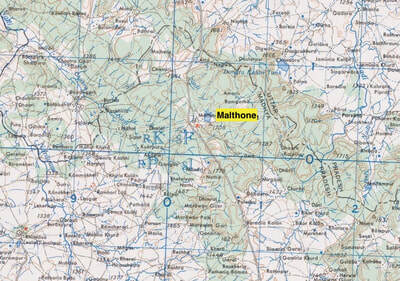 They took a final drop near Taunggon, but suffered terribly on the return. The same can be said of Major Scott’s No. 8 Column. They went far to the north, hindered by growing numbers of sick and wounded. A skilful pilot rescued a large party of sick and wounded who could go no further when he put his C-47 down in a small jungle clearing. Major Fergusson’s No. 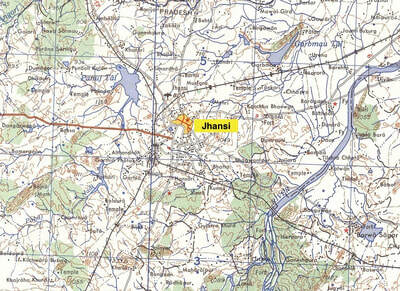 5 Column were now close to Hintha village and they found the jungle impenetrable, choked with prickly bamboo. He had no choice but to take the entire column through the village. The Column Commander went in first at night, grenade in hand and escorted by two companions. It seemed peaceful enough. There were four figures sitting around a fire. Fergusson assumed they were Burmese and approached. He introduced himself and suddenly realised they were Japanese. Only a few feet away from them, he tossed the grenade into the fire and fled. He then ordered Rifle Platoon Commander Philip Stibbe to go in with his men to clear Hintha with the bayonet. Stibbe was wounded in the action. Fergusson also had grenade fragments in the leg. In a long and fraught night they found it impossible to break through the village but eventually found a way around the enemy positions. Fergusson ordered “second dispersal” sounded and the column broke into smaller parties, setting out independently for a pre-agreed RV. Unfortunately, not everyone had that RV. Stibbe’s platoon covered the withdrawal. Stibbe spent time on a casualty pony but soon reached the point where he could go no further. He was left behind, but in the company of Rifleman Maung Tun, who kept him alive by foraging for food. He never returned from one of these missions and Stibbe became a prisoner. Maung Tun had been captured, tortured and executed, but he never revealed Stibbe’s whereabouts. 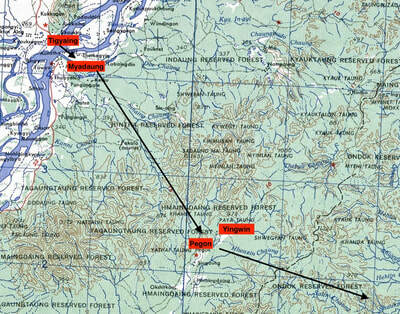 As Fergusson’s dispersal group neared Inywa they heard firing and assumed the Brigade’s crossing was being opposed. Some elements of Gilkes’ 7 Column had come under fire on the river, while in mid-stream. Fergusson was aware that Wingate had ruled that dispersal groups should be no larger than 40, but he took the opposite view. Whilst his Column had shrunk significantly, as some groups had failed to make the RV, he still felt his force was large enough to deal with any likely opposition. 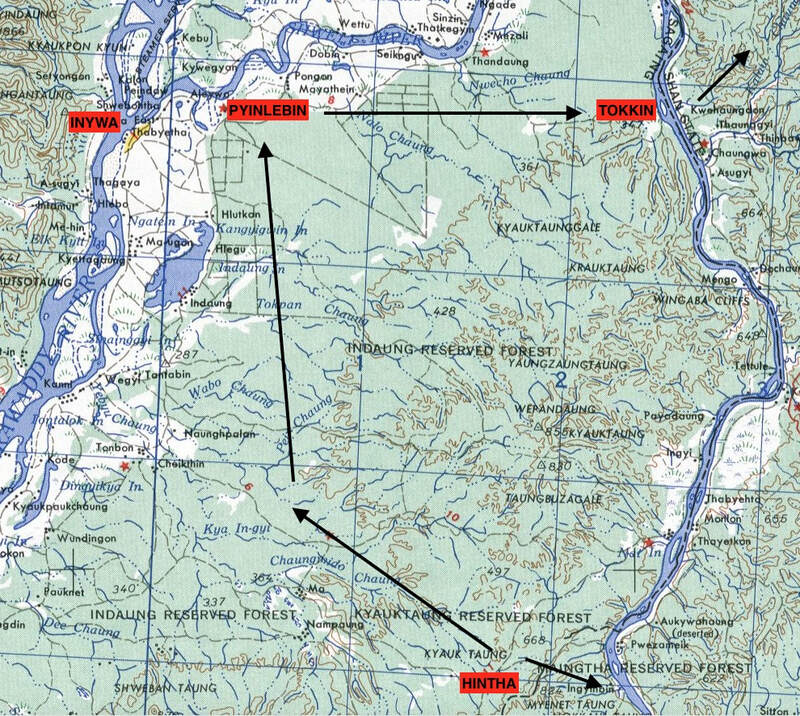 Furthermore, he decided to leave the troubled Inywa area, heading north and east with the aim of crossing the Shweli and entering the relatively friendly Kachin hills. He learnt that most of his missing elements had joined up with Major Gilkes’ 7 Column. On the negative side, his first attempts at crossing the Shweli were thwarted by lack of boats and the presence of Japanese in the locality. 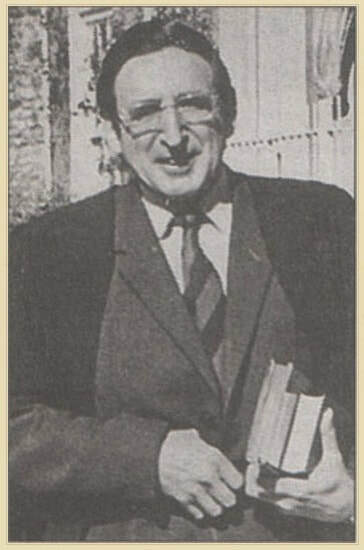 The decision to cross the Shweli was to change Bernard Fergusson’s life. His men were ferried across the Shweli in the night hours by Burmese boatmen, but they were betrayed. At dawn they found they had been left on a huge, jungle-covered sandbank, with a fast-running channel separating them from the far bank. Fergusson described the scene confronting him: “There was no word for it but ‘nightmare’. The roaring of the waters, the blackness of the night, the occasional sucking of a quicksand were bad enough, but the current was devilish. At its deepest it was about four feet six or a little more. I am over six foot one and it was more than breast-height on me. The current must have been four or five knots. It sought to scoop the feet from under you and, at the same time, thrust powerfully at your chest. The only method of progress was to lean against the current, to attempt to keep an intermittent footing, to maintain your angle against the stream, and kick off the ground whenever your feet touched it. If once you lost your vertical position, you knew as a black certainty that you would disappear down the stream forever. Fergusson now led a group of nine officers and 65 men – most of those who remained on the sandbank were soon taken prisoner by the Japanese. A large group of Fergusson’s men had been left on a sandbank in the treacherous Shweli. This river would also impose a severe test on Major Scott’s 8 Column. The main body of No. 8 reached the river on April 1. Their first attempt at crossing failed when the rope of an endless pulling system was cut, with the resulting loss of their dinghies. The 35 men already across were ambushed, leaving just one survivor. More boats were dropped on April 3; they crossed and headed north towards the Irrawaddy. Three days later, on April 6, No. 8 Column fought an action against Japanese manning a strongpoint. The enemy were reinforced by truck but the fresh troops were ravaged by concentrated Bren fire. A Sergeant and Section of seven men vanished during this fight. Scott took a supply drop at a position 15 miles to the north. The Column Commander then called an officers’ conference and canvassed opinions. The majority favoured continuing north, having had enough of the Irrawaddy and Chinwin. 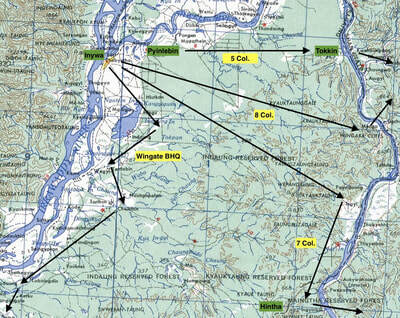 They broke into small dispersal groups, with each group leader free to select his preferred route out. The Column Commander was also drained by the nightmare of leaving a large group of men behind on the Shweli sandbank. They now headed away, in a south-easterly direction towards potential sanctuary in the Kochaung Hill Tracts, the home of friendly Kachins. They would then have to take a decision. Should they go for the Chinese frontier, around 100 miles away, but having no knowledge of Japanese forces in the region or even whether Chinese territory was still in Chinese hands? Fort Hertz was still in Allied hands but was 400 miles away… and they had no maps. There were also no maps and no news of Japanese dispositions for a third option – go up the eastern side of the Irrawaddy, to roughly the latitude of Myitkyina, then cross the Hukawng Valley. Another option was to cross the Irrawaddy between Bhamo and Katha, enter the Kachin Hills, cross the railway and exit by the Uyu Valley to the Chindwin. They thought they had shaken off the enemy and it was unpleasant to discover that there were Japanese resident in Kundaw village, where they had hoped to buy food. They moved away, having decided to enter no village until reaching Kachin territory. They had another 25 miles to go and they had nothing to eat. On the morning of April 3 they saw signs of a Kachin village ahead, entered and received a warm welcome. They were then warned that the Japanese had visited the day before and had ordered a meal for today. Happily, the villagers of Zibyugin were prepared to sell the food to Fergusson’s men. They each received about two cupfuls of rice and a golf ball-sized piece of pork. The villagers added that the Japanese had come from villages to the east…exactly where they were headed. The food was enough for two modest meals. 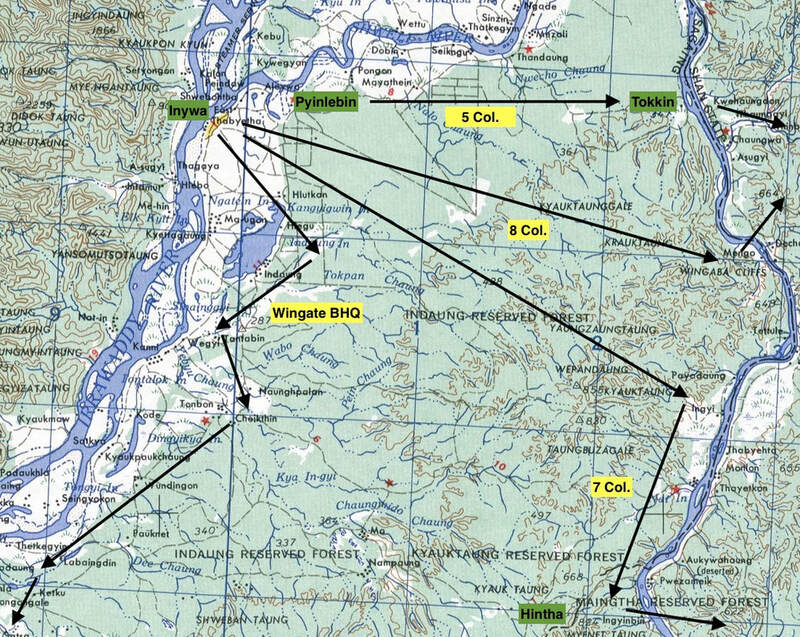 Now they needed more information in order to decide which course to follow, whether to go east or north, to China or Fort Hertz, or Myitkyina or Bhamo. It was decided to send a patrol back to Zibyugin, for more information. It was led by Lieutenant Duncan Menzies, MC. They left the main party. After an hour, shots were heard. About three hours later, two members of the patrol arrived back; they had been walking in circles, trying to find the bivouac. The Japanese had been in the village and fire was exchanged. Menzies and another held the enemy off as the others escaped. Fergusson was very close to Menzies and he spent a miserable night, waiting until dawn before moving off. Fergusson soon discovered the truth. 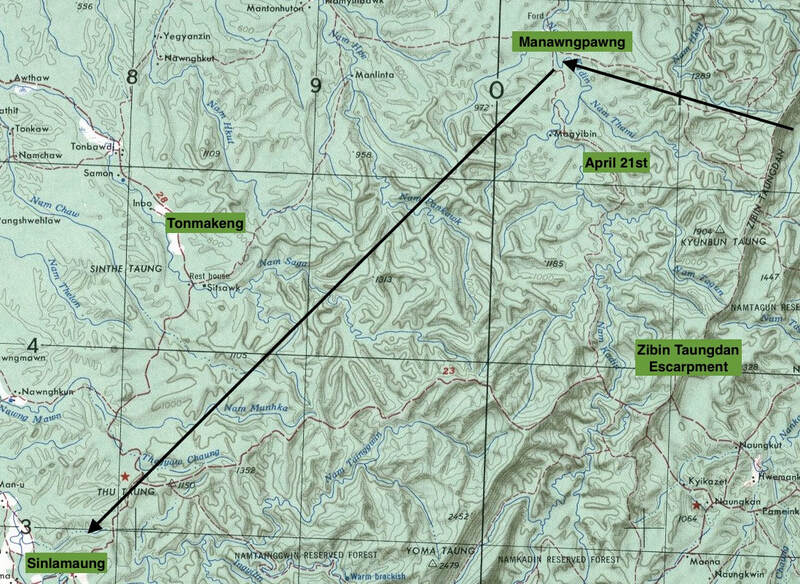 The Burma Rifles headquarters – around 100 strong – attacked Zibyugin the next day, April 4. Duncan Menzies and his companion were found tied to trees, dressed in Japanese clothes and with their beards shaved. Fergusson wrote: “Gilmartin was dead and Duncan was dying. Both had been shot when the Burrif attack came in. Duncan was still conscious and told Colonel Wheeler and Peter Buchanan about the movements of No. 5 Column, and described how the bulk of the Japanese had left the village, presumably in search of my party. Major Fergusson’s No. 5 Column group endured what he called a “cheerless march” on April 4. They were making for the Irrawaddy at a point “somewhere between Katha and Shwegu”. Fergusson’s intended track was now a motorable road too dangerous to use in daylight. They waited until nightfall to begin the march. For the most part this road ran along the heights, with thin jungle to each side. This road dropped into the Irrawaddy basin at Ngosin village. About a mile from this village they came upon a stream, filled their water bottles and went into the jungle to make milkless, surgarless tea. The men tried cooking grass with the appearance of asparagus, but this proved impossible to swallow. There was no sign of that life-saving staple – bamboo shoots. The group trekked westwards, to the point where relatively open ground was at its narrowest. They descended to the low ground, scrambling across a motor road at the bottom. As noon approached they were in breast-high dry, dusty grass, with occasional clumps of low trees. Weakness forced halts every 20-30 minutes. In the late afternoon they approached Kantha and Fergusson called his officers together, rounding on them for being slow on the uptake. Fergusson himself could hardly speak. He was reminded, quietly, that these were merely symptoms of lack of sugar. They were then bitterly disappointed, as Kantha was found abandoned. Apathy ruled in the bivouac that night. Yet, they had touched bottom and their luck was about to change. Every decision Fergusson took from then on was largely instinctive and it always seemed to work out, even when based on “hunches” and lacking in logic. They continued to cut up and cook and by the evening their packs and pockets were stuffed with roast meat. The new day saw them in fresh heart but progress was soon blocked by an extensive marsh. They went westwards and met a party of boys fishing, who were willing to lead them through the marsh, to Seiktha village and the possibility of food. 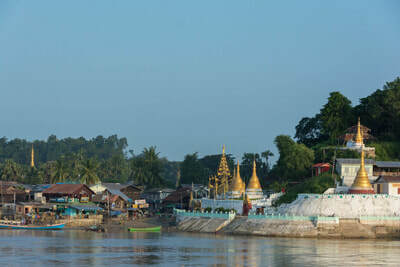 They arrived in mid-afternoon, the village being only four miles away from the Irrawaddy. They left after an hour, laden with seven days’ rice each, together with slabs of a fudge-like cake. About a mile out they stopped and cooked a feast of rice and meat. They had a guide from Seiktha to take them on to Thabyehla, where they would be introduced to someone who might be able to organise boats. 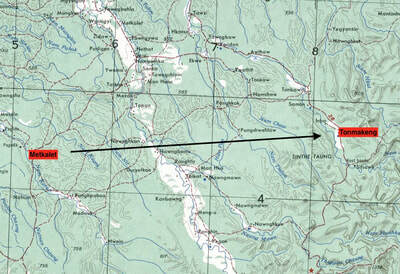 Their night bivouac for April 7-8 was about three miles from Thabyehla, on a backwater of the Irrawaddy. They would start out at first light, get to within one mile of the village and the guide would then go forward to sort out the boats. They waited long, anxious hours for news of the negotiations. The guide had been given money to smooth the way, which he obviously pocketed as he failed to return. That night Fergusson decided that it would be safest to split his group into three parties, but the following morning sent a representative back to Seiktha for more help. This did not go well – the Japanese had since called and further help was refused. This prompted Fergusson to go ahead and make the split, with around 22 men in each party. Two groups were led by Captain Tommy Roberts and Flight Lieutenant Denny Sharp. After the split Fergusson’s party (four officers and 20 men) headed north and came upon a colony of fishermen. They promised to ferry them across that night, but they deserted during the afternoon. Fortunately, two teenagers then turned up and were willing to help. The boats leaked badly, but, finally, they made it across. Bernard Fergusson’s group had now shrunk to just over 20, following division into three dispersal parties for the Irrawaddy crossing. 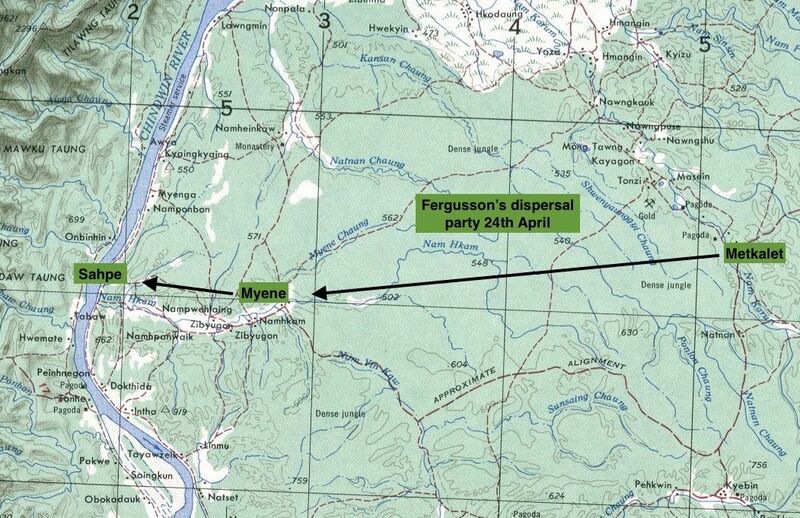 On April 10, with the river behind them, Fergusson’s group entered very thick jungle – their home for the next two days. They then came across two Kachins who had just been guiding another No. 5 Column dispersal group, led by Denny Sharp. 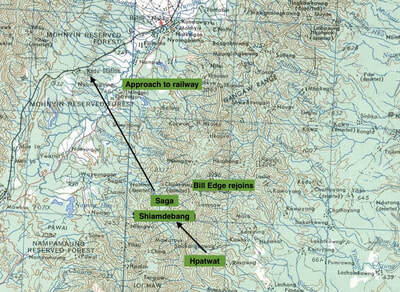 They told them to continue on the present track, as it led to Hpatwat village. “Already we were far up the side of the hills and could see away behind us that revolting river, the Irrawaddy.” They were given lunch and moved on, reaching Shiamdebang village that evening. They slept there that night. In the morning, they looked out across railway valley. Their next destination was Saga village and another warm reception. Fergusson, by now, had adopted a simple rule of thumb: his aim was to maintain five days’ rice stocks as they marched. The re-supply at Saga was interrupted by news of an approaching Japanese patrol. They decided to get out. The problem with a fight was that they would have to be absolutely certain of killing everyone in that patrol – a single survivor would bring retribution down on the village and also threaten the other dispersal groups. They took shelter in a thick clump of bamboo, until the Japanese patrol left the village. Meanwhile, Fergusson’s party had increased by five with the addition of Lieutenant Bill Edge and two British and two Gurkha soldiers, who had managed to avoid the Japanese. Fergusson’s group set out for the railway in the late evening, assisted by guides. They entered a village where almost everyone was drunk and received a riotous welcome. They left and began marching along a motor-road, moving parallel to the railway. They took a branch road after several miles and put in a similar distance, then the guides’ confidence, together with Fergusson’s, began to waiver. Soon they found themselves very close to Kadu railway station. They pressed on, keeping clear of the station and the patrolled area. They could just about make out the railway … then they heard a train. When it had passed they crossed the line, found a bivouac and settled for a sleep. They pushed on at dawn but their guides from Saga then announced that they had reached their limit. Fortunately, their duties were taken over by a passing Kachin volunteer. The young man set a challenging “crow flies” route straight up and down the steep hills and Fergusson was eventually forced to call a special halt. It turned out that the guide had been a Lance-Naik in 3rd Battalion Burma Rifles, who had been wounded in the last campaign and left behind. On reaching the hill village of Pinmadi, the welcome was unusually cool. They were persuaded to leave and rest in a thick bamboo clump. They received a meal from their reluctant hosts, who had had plenty of contact with the Japanese. Fergusson decided to move on as quickly as possible. The hard-going was making the Major’s hip wound very sore. Their march on April 15, according to Fergusson, was “a shocker”. Their weak condition left them prey to illness. He knew that, if he had to leave anyone behind, they should be left in the safe care of Kachin villagers. The journey continued across the steeply folded country, from one hilltop to the next. 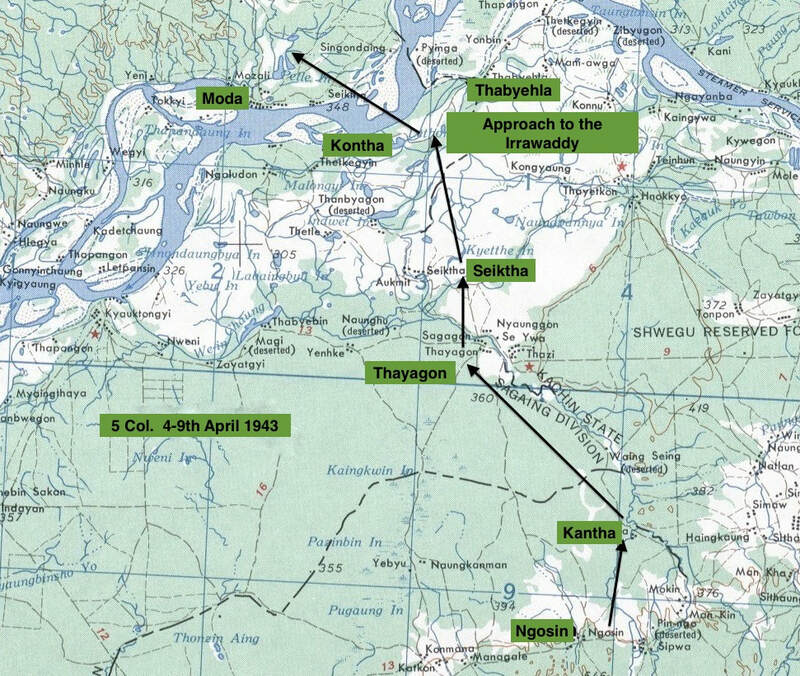 They reached Natmauk village, slept well and by the afternoon of the next day, April 16, had reached Kumsai, where they stocked up with rice. They then spent the night at Kaungra, two miles on. 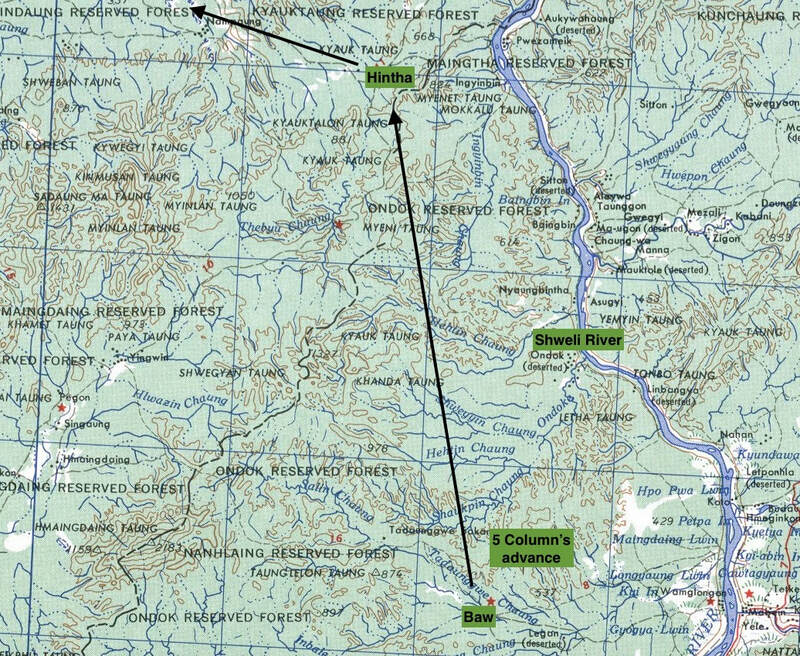 On April 17 they went only three miles before entering Pokaw, a large village, where they were reunited with Denny Sharp’s group. They eagerly swapped adventures. 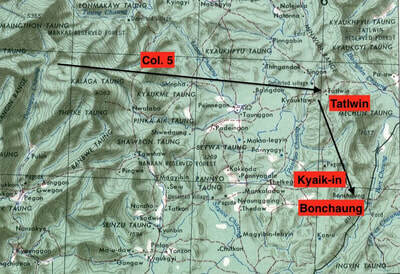 The Chindits were now just six miles from the edge of Kachin territory and the more hostile world beyond. Sharp’s party pressed on westwards; Fergusson’s men stayed for breakfast and then moved off. 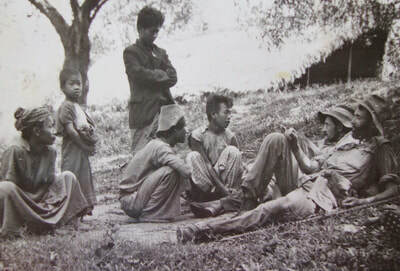 Bernard Fergusson’s dispersal group left Pokaw at mid-morning, with guides leading them to the Meza River, in this area a rocky torrent in a deep gorge. 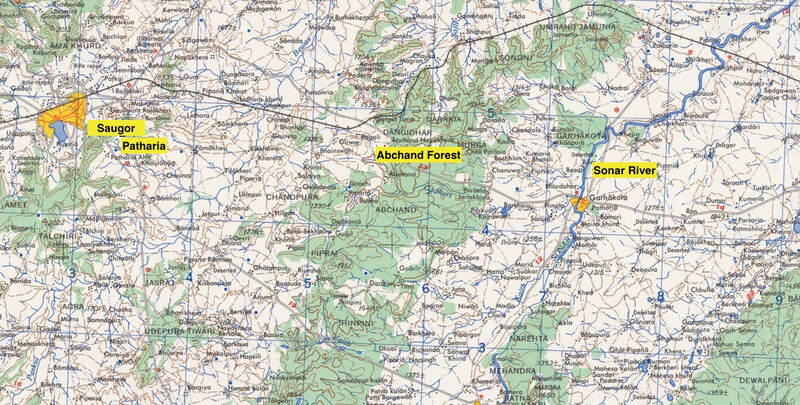 This was the divide between Kachin and Shan-Kadu territory. As they headed towards the Meza ford, their guides warned them of Shan-Kadu collaboration with the Japanese. Many of the villages were garrisoned. Their Kachin guides then implored them to keep out of sight of the Shan-Kadus and give the big Japanese garrisons at Mansi and Nanantuna a wide berth. When they reached the Meza, there was no sign of Denny Sharp’s party. They gave the guides a couple of grenades, to catch fish. This was followed by a farewell meal and bath-time – the first real wash for most for 10 days. Then came the river crossing and the climb out of their Kachin sanctuary. 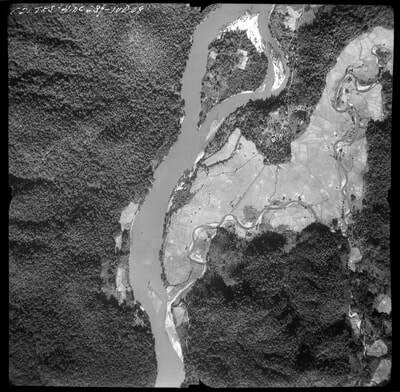 Major Bernard Fergusson’s dispersal party had been warned, on leaving the Meza River, that there was only one stream in the next 10 miles of their march towards the Chindwin. They stopped as night fell on April 17, just short of the pass through hills that would lead them down to the valley and more dangerous territory. 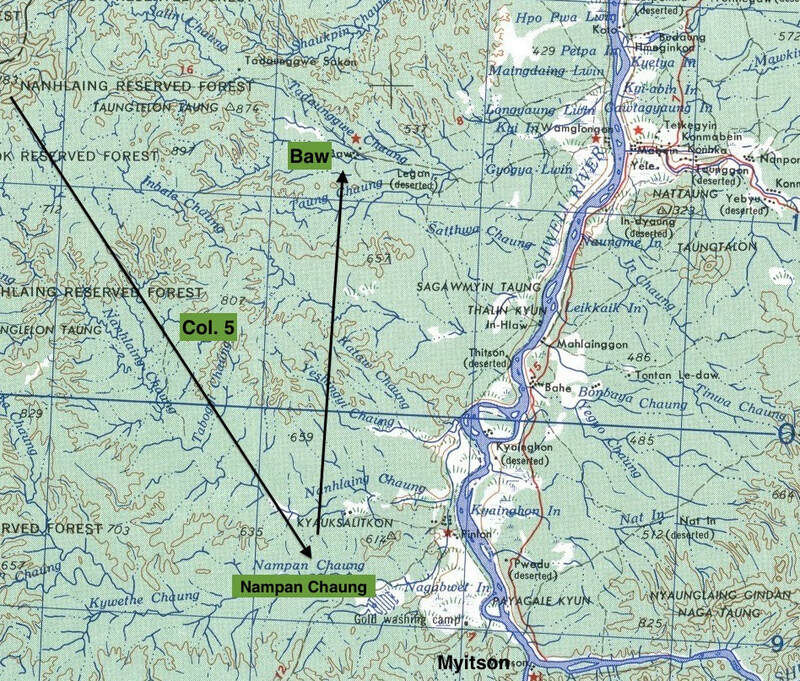 The next morning, April 18, saw Fergusson’s group reach the west side of the pass, where the jungle was teak and less dense. They skirted the first village, Nanhkin, put off by a notice in Burmese warning “Nobody allowed in Nanhkin without a pass”. They stopped beside a small chaung for breakfast. Fergusson maintained discipline: some men were lax and used wet wood for their fires. They were punished by the denial of breakfast. On leaving, the going was unpleasant - they pushed through bizat bushes and the undergrowth released irritant particles that percolated down their necks. They were crossing open paddy when they ran into a group of locals, who promptly fled. Their presence was no longer a secret. As they entered jungle they found two brothers who said they were willing to guide them. Fergusson realised that Kachin knowledge of the area was out of date and that the Japanese presence in the valley had thinned. Yet Denny Sharp’s party had bumped a Japanese patrol just two miles to the north of them. This group took some casualties but hit a couple of the enemy before they withdrew. 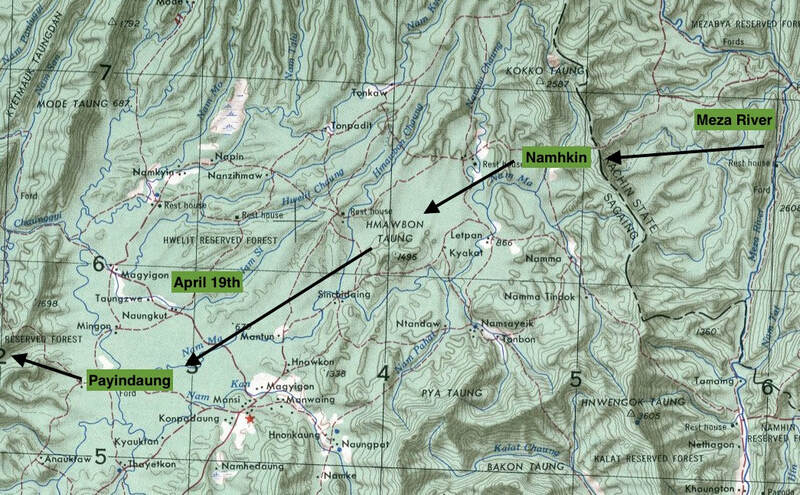 Their guides left them at noon on April 19, south of Hmawbon. They reached the banks of the Chaunggyi just before dark and ran into the headman of a local village, who organised rice and tea for the evaders. His companion, a former employee of the Bombay Burmah Trading Corporation, stayed with them and discussed their route to safety. His dispersal group now confronted the challenge of the Zibyutaungdan escarpment. There were several routes across and Fergusson received conflicting advice from the locals. Eventually, he decided to take the Payindaung track. Fergusson had no knowledge of it but it seemed preferable to the other options. His mind had rebelled against the Chaunggyi gorge. It would take two days to thread their way through its narrow defile. If spotted, it would be easy for the Japanese to trap them at the western end. Yet, he was persuaded to change his mind in the morning and they were soon inside the gorge. They had to wade for around a quarter of the time. They left the Chaunggyi during the late afternoon of April 21, at the site of a deserted village. 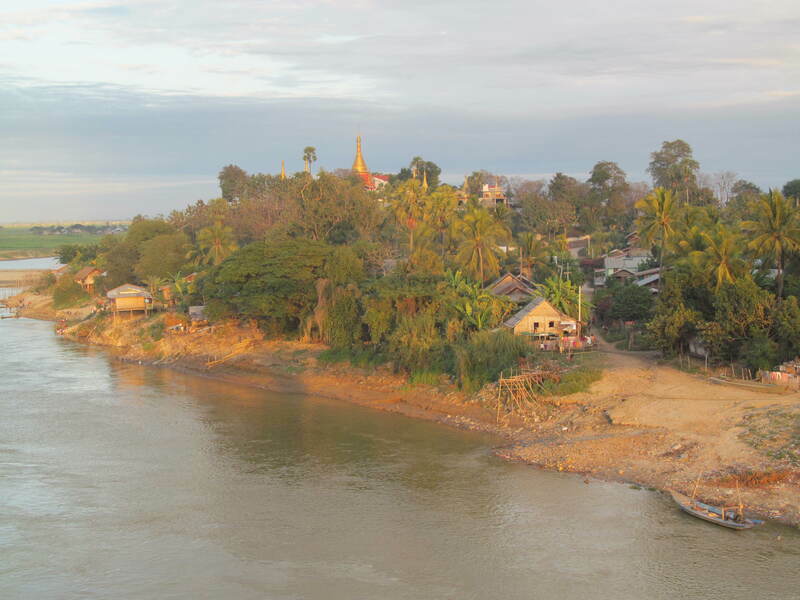 With local assistance they travelled on to the Nam Kadin and upstream to the village of Monawngpawng. This was deserted, due to the proximity of the Japanese, but the Chindits decided to rest. Fergusson was then told of a force of 200 Japanese who would almost certainly have confronted him, had he taken the Payindaung track. A new guide briefed them on the strength of Japanese garrisons in the region and advised on those tracks popular with the enemy. They held on to the earlier guides until dusk on the 21st, for security reasons. 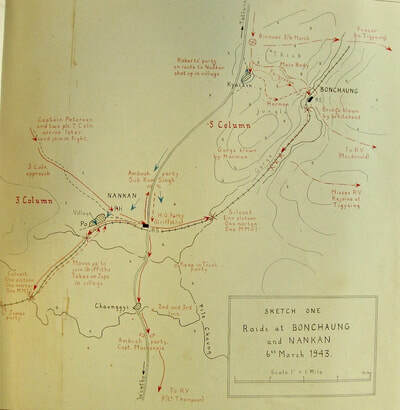 The men slept in bamboo, off the main track from Nawng-puaung to Sinlamaung. 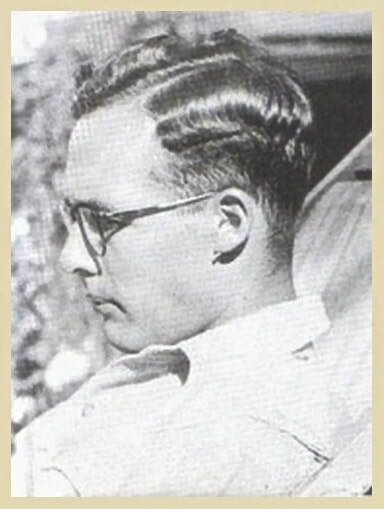 Bernard Fergusson had reached the edge of his last map and there remained around 20 miles of country to cross before they reached the Chindwin beyond Myene. Fergusson wrote: “I was intending to cross at the bottom of the Myene Valley, where we remembered having seen boats just after our original crossing.” Every man realised that holding on for the last 20 miles to the big river would determine whether or not they had a future. Bernard Fergusson’s bedraggled score or so Longcloth survivors set out for the Myene valley and the Chindwin, 20 miles distant. There was five miles of open paddy to cross and that would have to be done by night. Despite their starved condition, they had covered 100 miles in the past six days. Yet Fergusson remained cautious: they marched by moonlight for the next two days, laying up by day. 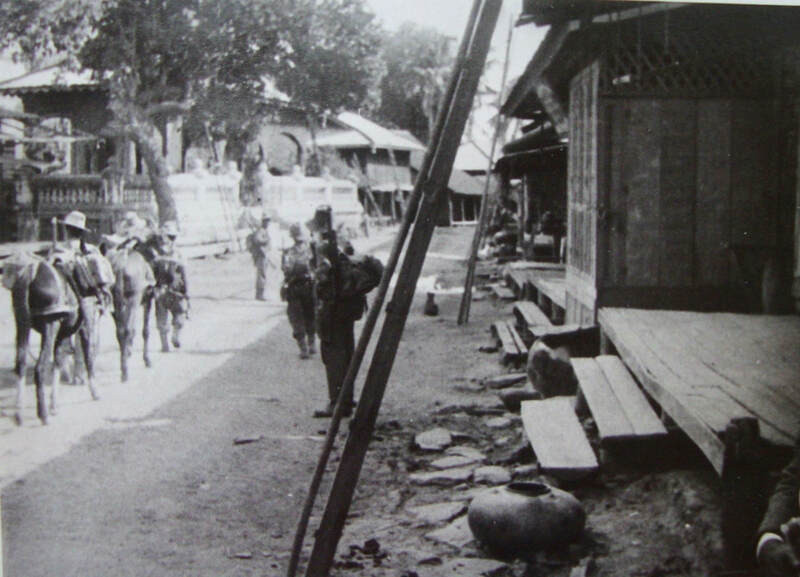 On the morning of the 24th they reached Myene village but found the villagers “surly and suspicious”, according to Fergusson, as a result of recent Japanese “bullying”. Fergusson’s party stocked up on rice at Myene and at the next village. They took guides to continue their trek, with four of the party finding it difficult to keep the pace. One of the guides then said that there were British soldiers across the river and the pace quickened. On reaching Sahpe village, only 500 yards from the riverbank, the headman told them that they had just missed a British patrol. The patrol had recrossed the river, using the available boats. However, two small boats suddenly appeared and Fergusson sorted out his group of four officers, 25 other ranks and a Chinese national. He ordered eight men to stop making tea and get into the boats. They went with no reluctance; soon, all were across the Chindwin. 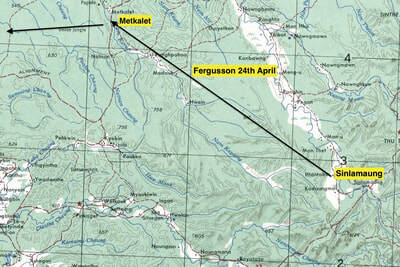 Fergusson reached Imphal on April 26. Gradually, news of the other dispersal parties came in. Some crossed the Chindwin. Others went in a different direction. Bill Smyly was amongst those who reached Fort Hertz. He was burdened with malaria and dysentery. Bernard Fergusson's party reach the Chindwin River at Sahpe. 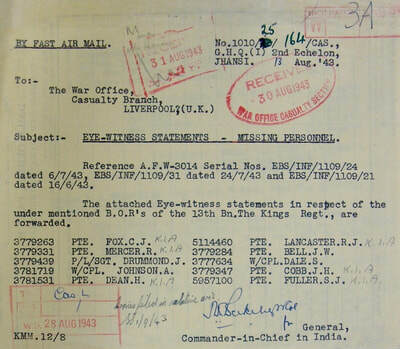 The official closing date for Operation Longcloth was 12th July 1943. After this date, all personnel still unaccounted for were marked down as missing in action. By the above date, 2182 Chindits had returned to the safety of Allied held territory, out of the 3056 men that had crossed the Chindwin River on or around February 15th. British POW’s are recorded at 248, with only 102 of these men surviving their ordeal to see liberation in May 1945. Gurkha and Indian POW numbers are more difficult to estimate, but can probably be set around the 100 mark. 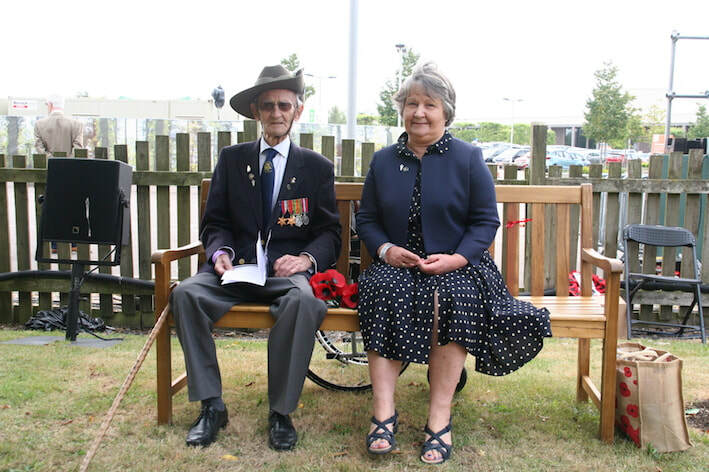 Of the returning Chindit soldiers in 1943, very few took up arms again, with less than 200 Longcloth veterans serving again on Operation Thursday in 1944. 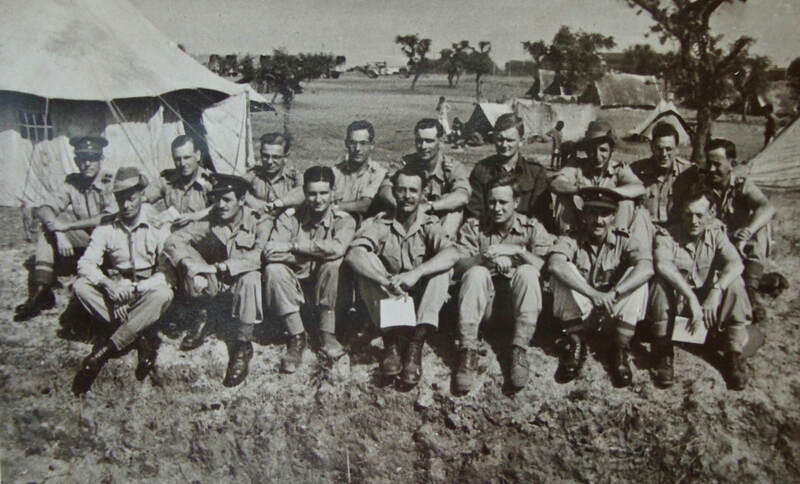 Much to the surprise of many returning Chindits, Operation Longcloth was hailed in the international press as a daring and successful raid against the Japanese. In reality, very little damage was done to the Japanese lines of communication and infrastructure in 1943; however, Winston Churchill took full advantage of the story, using it as a powerful propaganda tool back home in the United Kingdom. The raid behind enemy lines dispelled once and for all, the strongly held myth that the Japanese were unbeatable in jungle terrain and boosted the morale of British soldiers throughout India. 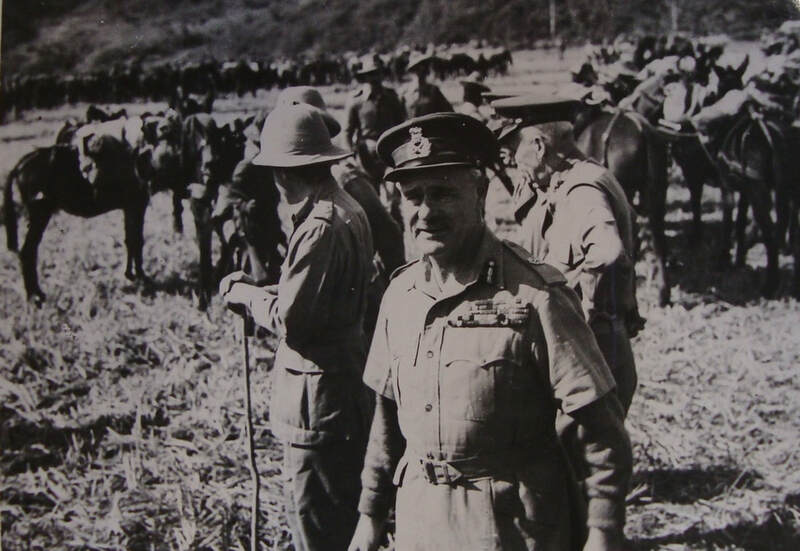 The ever loyal and supportive General Archibald Wavell had gambled on Wingate’s success and had raised a second Chindit Brigade (111th), whilst Operation Longcloth was still active in the Burma. The first Chindit expedition went a long way in proving Wingate’s theories for Long Range Penetration. It also confirmed the use of radio communication and air supply in keeping large numbers of troops operational in the field. After the war, captured Japanese Generals remarked how the first Wingate expedition had caught them unawares and that they had never expected an Allied incursion through that region of Burma. It also planted the seed in their own minds, that it might well be possible to attack India through the same terrain and accelerate their conquest of the sub-continent. This resulted in their Assam offensive of 1944 and the famous battles at Imphal and Kohima, which ultimately overstretched the Japanese war machine in Burma and affected its ultimate demise. Operation Longcloth was heavily criticized for its extremely high casualty rate and the horrors of having to leave behind sick and wounded men. This had a disastrous effect on morale in 1943. 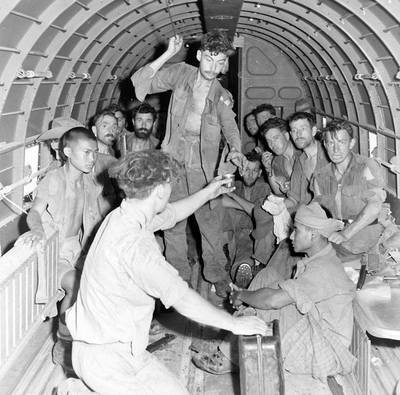 With lessons learned, General Wingate ensured that men in similar predicaments on Operation Thursday would have the chance of being airlifted out of Burma aboard one of 1st Air Commando’s L-5 Sentinel aircraft. Flight-Lieutenant Denny Sharp's dispersal group, safe and sound over the Chindwin River. ​Copyright © The Chindit Society, April 2018.